After having dived into the history of my father's 1948 home-built TV, early Philips television development, and the EQ40/EQ80 enneode, it is almost logical to tackle the next topic: the TV tuner. On the one hand the tuner is one of the key functions in a television, which has - being an RF engineer - my warmest attention. But secondly it is again a very personal story because I've been active in the development of tuners and their key components for 25 years. And thirdly there is a certain nostalgia, because in today's internet-connected Smart TV's tuners hardly have a function any more, also because terrestrial off-air transmissions have almost completely stopped. This story is thus also a tribute to a very complex building block and the people that worked on making it ever better, smaller, cheaper and more advanced. Although there have been many brands of tuners - initially every self-respecting TV set maker also designed its own tuner - I will again use Philips as the representative storyline. Not because they were necessarily the first or best in every aspect (although Philips was of course good and quite innovative), but it definitely is a representative player, being active from the first post-war TV until a few years ago, ending as one of the three biggest tuner manufacturers and one of the two surviving set makers with a tuner activity (Matsushita-Panasonic being the other one). Furthermore Philips was a classical vertically integrated company, with all components, the (tuner) module and the final sets all produced in house. On the first two there is quite some historical data available, while the last two periods are part of my personal history. The challenge will be the middle phase. The basis of all radio-based broadcasting and communication systems is always the same: information (which was in the past of course always analogue, today almost always digital) is modulated onto an RF frequency carrier signal, fed to an antenna and then transmitted into the ether as electro-magnetic waves. In this story RF (Radio Frequencies) means carrier waves above 50MHz and below 1GHz. For the tuner story the actual modulation format of the carrier is fairly unimportant, but for the analogue television that we're looking at it is of course Amplitude Modulation (AM), or more precisely Vestigial Side Band Amplitude Modulation (VSB-AM, or simply VSB), where one of the two classical AM sidebands has been largely filtered away. The initially more relevant parameter is the bandwidth of the modulated signal, which is more or less equivalent (but not identical to!) the Channel Bandwidth. For early TV standards the channel bandwidth was still in the order of 5-6MHz, but then quickly settled on mostly 7 and 8MHz. This means that all information of each transmitted TV channel is contained within a frequency band equal to the channel bandwidth. At the receiver side an antenna picks up the much weakened EM waves of the transmitted signal, translating them into electrical signals equivalent with the modulated carrier wave. This is where the tuner comes in, because it is the module directly behind the antenna. The tuner function is at the highest level two functions: 1. to translate the RF signal to an easier to handle lower frequency, which is referred to as the Intermediate Frequency (IF), and 2. to filter out only the wanted signal. We will start with point 1. To the right is the block diagram of a typical RF receiver, in this case a TV Tuner. For the first basic function we only need to look at the three active elements: the pre-amplifier, the oscillator and the mixer. As soon as possible behind the antenna a low noise pre-amplifier amplifies the signal with the main objective to guarantee a good Signal-to-Noise Ratio (SNR). In every step of the television receive chain a bit of noise is added to the signal, so by amplifying it to a sufficiently large level the influence of these later noise additions is minimized. In the ideal case - which is never achieved - only the noise of the pre-amplifier determines the SNR. m.fLO +/- n.fc, with m and n integers . This is shown in Fig.2. For a receiver only one combination is of interest: m=1 and n=-1, or the resulting frequency fLO-fc. If the LO frequency is slightly higher (say 30MHz) than the carrier frequency the resulting output signal will be a down-converted carrier at 30MHz. This difference frequency is called the Intermediate Frequency (IF). All other mixing products of the RF and LO signal are at much higher frequencies, which means they can all be filtered with a Low Pass Filter. The output of the mixer, after filtering, is then only the down-converted modulated carrier at the IF. Figure 1 The basic block diagram of a Television Tuner. It contains three active elements: a pre-amplifier, an oscillator and a mixer. All other blocks represent filters of different sorts, where three of them are variable ("tuned"). Figure 2 The elementary down-conversion concept of a so-called super-heterodyne receiver as used in all TV tuners. For the first years of television broadcast the situation was still straightforward: in principle the owner of a television set was able to receive signal from exactly one transmitter. In the UK this was either Alexandra Palace in London or Birmingham, in France Paris (from the Eiffel Tower) or Lille, in the Netherlands initially the Philips Experimentele Televisie from Eindhoven, later Lopik/IJsselstein. 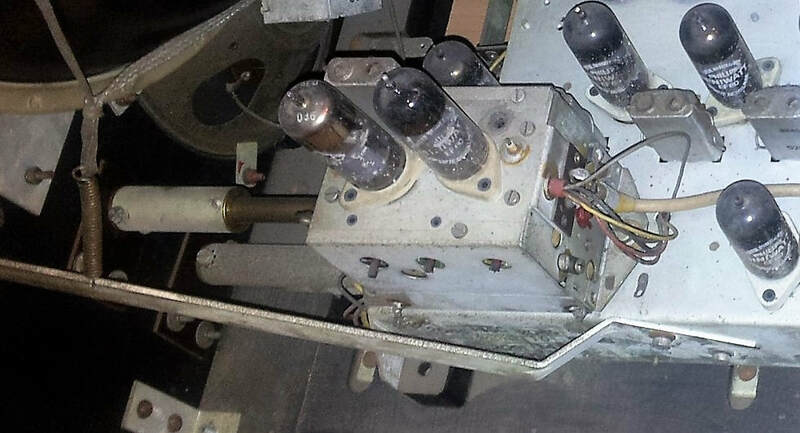 The RF receivers of the first generation post-war televisions where thus set to the single RF channel transmitted in the area where the set was sold. So although some filtering did take place, the basic concept of the television receivers of the Philips TX380, TX390 and TX400 platforms (from 1948, 1949 and 1950, respectively) was as shown in Fig.2. The first post-war commercial television set from Philips were the 463A and 563A, for the 405-line UK market and designed by the Mullard Labs in Mitcham, South London. It was a 1946 design and clearly based on pre-war televisions. The 463A was a television-only, but the 563A combined television and radio reception. To this end it had the unique concept of separate mixer-oscillators for both video and sound, allowing the sound MO and IF chain to be shared between television and radio mode. This resulted in a very complex arrangement of tuned circuits for four (!) bands around the sound MO. Clearly this was a too radio-centric design, essentially a television built around a radio instead of the other way round, and this concept was never re-used in any other Philips TV set. 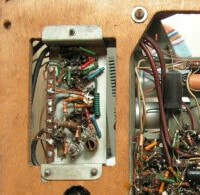 The picture left shows the RF receiver front end of the Philips 385U, a set for the UK from 1949. It was based on a platform design by the Apparaten Lab (Devices Laboratory) in Eindhoven but product development was done in the Mullard Labs in Mitcham. It also introduced the much more compact 40-series Rimlock valves. The set was produced in two versions, one for London, where the Alexandra Palace transmitter station used the picture carrier frequency of 45MHz, and one for Birmingham, with a transmit frequency of 61,75MHz. In case the TV owner moved from one region to the other the set had to be re-aligned in a service work shop. 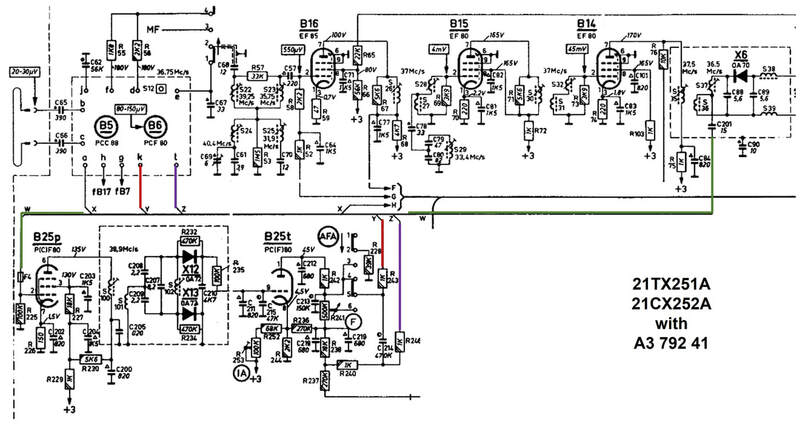 From the circuit diagram we can see that the amount of filtering in this front end was still minimal. At the input is a matching network to transform the 300 Ohm antenna impedance to one better matching the UF42 g1 input impedance. 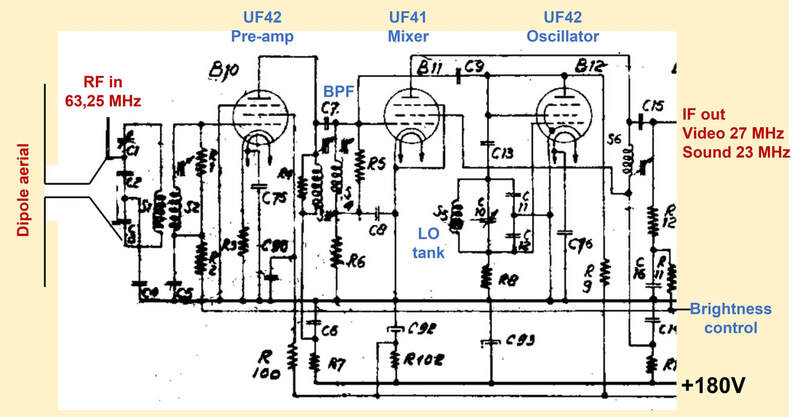 There is a tuned Band Pass Filter (BPF) between the first and second stage, while a single-tuned serial filter S13-C31 in the feedback loop of V10 sets the oscillation frequency of the self-oscillating mixer in the second UF42 pentode. The gain of the first amplifier could be adjusted through the voltage of the line marked "Brightness". This was connected to a potentiometer for a fixed setting, and thus not an Automatic Gain Control (AGC); that would come only later. A front end as shown here was the most basic form of receiver. A one step more advanced concept for a single channel receiver is shown here, the front end of the TX549U 625-line set. The input stage B10 (using an UF42) is almost identical to the one above of the 385U. However, the mixer and oscillator functions have been separated at he expense of an additional UF42 pentode (B12). The oscillator is a Colpitts, with direct (positive) feedback from g2 to g1 through a tuned circuit S9-C10-C11-C12. Through C9 the oscillator signal is fed directly to the g1 of the UF41 mixer (B11). In theory this arrangement should be optimal for performance; every function properly separated for maximum isolation and minimum crosstalk. At the same time the cost is high (three pentodes), so it will take another three years before we see it back in standard tuners. In practise the oscillator of the TX549 seems not to have been very good, despite its dedicated pentode. Especially when the set heated up it had the tendency to run away in frequency. At the time television sets didn't yet contain Automatic Frequency Control loops, and oscillators had to be intrinsically stable, but apparently they were not. Many of the surviving sets thus had additional variable capacitors with an external knob on the side of the set for corrective tuning. A similar but slightly cheaper implementation of this concept was used in the TF651A, the first Philips television set for the new French 819-line standard. 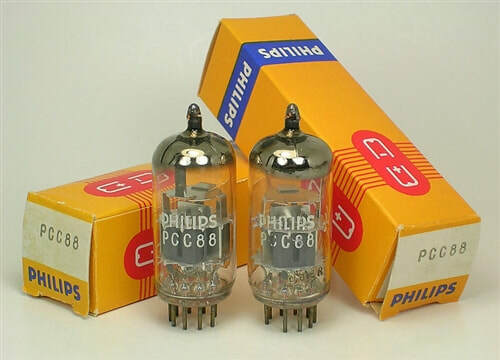 But instead of a pentode it used the cheaper EC81 triode, a valve not applied in any other Philips TV set. The French standard posed a number of challenges: it was the first to use the VHF-III band (the Paris Eiffel Tower transmitted at 185,25MHz), and secondly it had much higher bandwidth (14MHz per channel). Especially to cope with the latter requirement, the picture-IF of the TF651A was moved up to 36,15 MHz. (For comparison, the IF of the previous three receivers was around 13MHz). Finally it is noteworthy that the front end was designed for a 75 Ohm asymmetrical antenna, as opposed to the standard 300 Ohm dipole. The reception of RF signals becomes more complex in case multiple channels are transmitted. 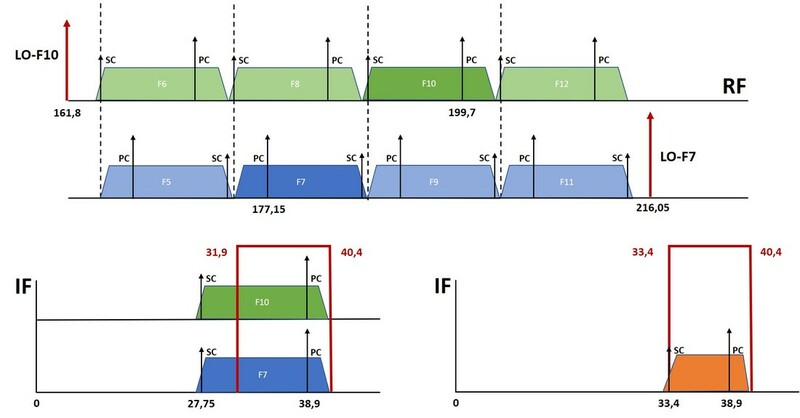 Fig.3 shows a simplified picture of a frequency band allocated to television transmission, here containing five channels. [The VHF-I band for CCIR-B standard signals contains 4 channels E1-E4 of 7MHz channel width, and thus runs from 41 to 69MHz]. The picture assumes channel 3 is the wanted channel, so the local oscillator is set to a frequency IF (around 30MHz) higher than the picture carrier frequency of channel 3. Channel 3 will thus be converted to fit exactly in the fixed IF band pass filter. However, because the RF channels are all present at the input of the mixer they will all be down converted, albeit in reversed order (see the bottom graph). 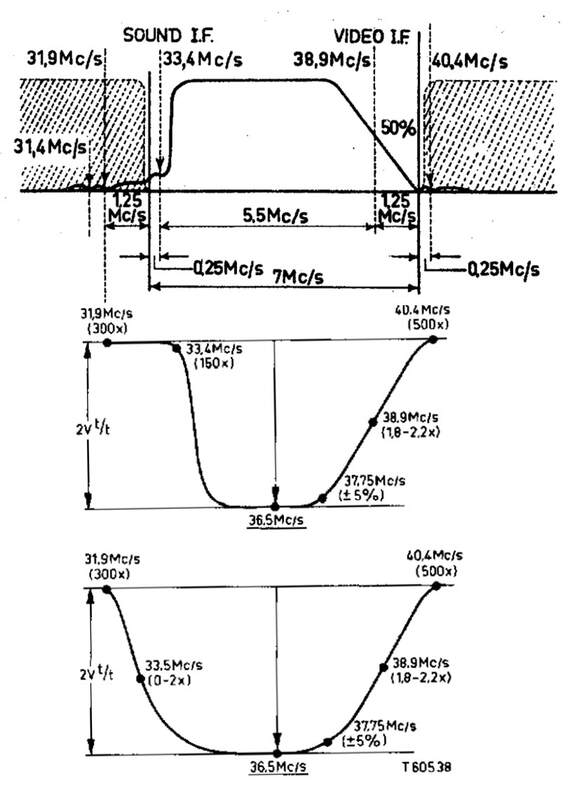 The problem is that the practical IF filter in (early) TV receivers was far from as narrow as suggested in Fig.3. 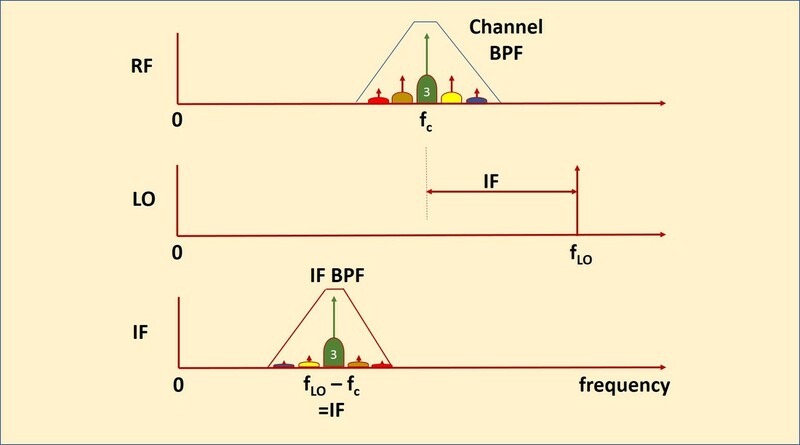 When the IF BPF is broader, adjacent channels from the wanted one will consequently also appear in the IF and video chain of the set, leading to distortion in either picture or sound. The remedy to this is RF filtering or channel filtering, as much and as early as possible in the receiver. This is shown in Fig.4. 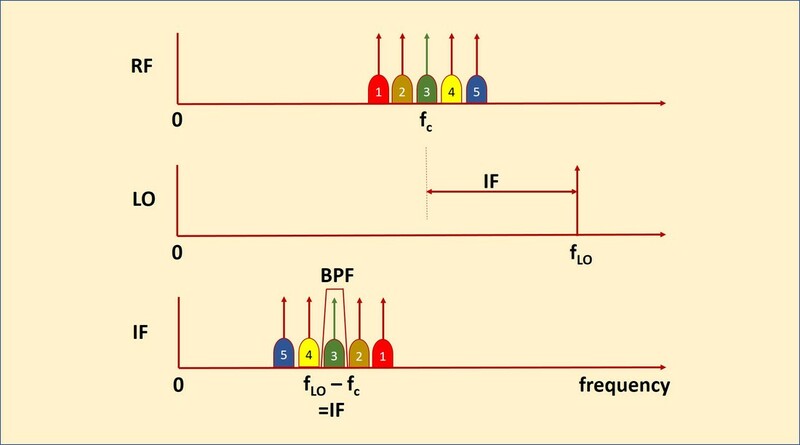 In practise this RF filtering would be achieved through the combined effects of the tuned input matching and inter-stage BPF, see Fig.1. The amount of reduction of the adjacent channels is usually referred to as "Selectivity"; the higher the selectivity, the better the tuner. Figure 3 Down conversion in the situation of a fully filled television frequency band with five channels, and without RF filtering. In this example channel 3 is the wanted channel. Figure 4. Down conversion in case of a fully loaded frequency band, but now with RF filtering. Although the IF filter is also depicted in a more realistic way, the combined filtering of the RF and IF filters gives a substantial attenuation of the unwanted adjacent channels. The last step to come to a real tuner is tunability. From Fig.4 it is clear that it is drawn for the situation of channel 3 as the wanted channel. 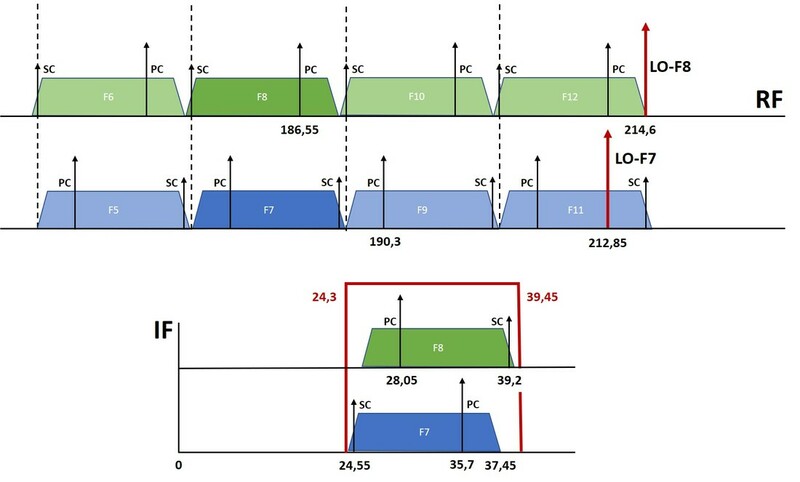 In case another channel is wanted, say channel 1, both the Channel BPF and the LO need to centre on that channel, which means that their centre frequency needs to reduce by two channel widths. In VHF-I for CCIR-B this would be 2x7=14MHz. This operation is called "Channel Selection" or in practise "Tuning", an expression dating from the earlier radio days, from which the name of the function is derived: "Tuner", although officially it is of course "Channel Selector". "Kanalwähler" in German, "Kanaalkiezer" in Dutch and "Sélecteur de Canaux" in French. 2. A dedicated tuner module. Until then the RF front end was simply built on the main chassis as part of the integral RF-IF-video/audio chain. In most cases there had been no RF shielding of the tuner section. With the A3 421 82 a dedicated tuner module was introduced, placed on top of the chassis, and providing proper RF shielding. 3. Noval valves, in this case the EF80, replacing the Rimlock EF42 or UF42. This didn't necessarily mean a major performance improvement, because neither the EF/UF42 nor the EF80 were dedicated RF valves; they were both essentially IF and baseband valves. Comparing the circuit diagram of the A3 694 42 with the previous single-channel front ends, we see that it has increased in complexity, although the input matching, the brightness control through the g1 voltage of B8 and the output filter remained more or less unchanged. For this first tuner the designers had chosen for capacitive tuning. So the inductors of the BPF channel filter (S27-S28) and the oscillator (S29+S30) were fixed, while the channel tuning was accomplished by simultaneously varying the BPF capacitor C64 and the oscillator tank circuit capacitors C70 and C71. The complexity of the tuning function should not be under-estimated. For tuning from channel 1 to 4 in the VHF-I band the BPF central frequency has to move from 43,5 to 50,5, 57,5 and 64,5MHz, while the LO frequency moves from 80,15 to 87,15, 94,15 and 101,15MHz. (In the TX400 platform the picture carrier IF was 23,5MHz). 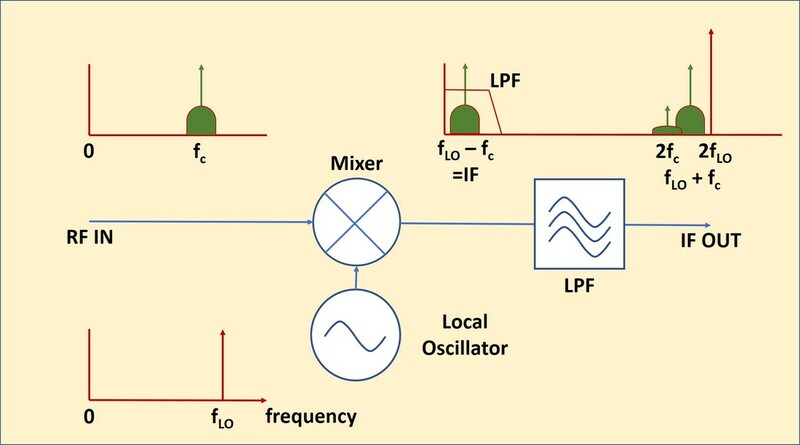 For each of the channels the error between the desired BPF centre and the LO should not be more than 100-200kHz to avoid picture or sound distortion. Especially the BPF had to tune in a linear way over a range of more than 30%, the LO more than 20%. It is thus not surprising that around the BPF and especially the oscillator there are a number of trimmers to guarantee a smooth and constant joint tuning of the BPF and LO. C66, C69 and C72 were all adjusted in the factory for optimal alignment at the upper edge of the band, and were trimmed at 64,5 and 66,75MHz. Other alignments were the IF output filtering, where S31 was tuned to the centre of the IF pass band (19,75MHz) and S32 was a trap at the picture carrier of the next channel (23-7=16,5MHz). Already the next year, 1952, yet another upgrade appeared: the 10-channel capacitive tuner AT7501. It obviously was not possible to tune across the combined VHF-I (40-68MHz) and VHF-III (174-223MHz) bands, and therefore the tuning range was split into two sections, one for each band. 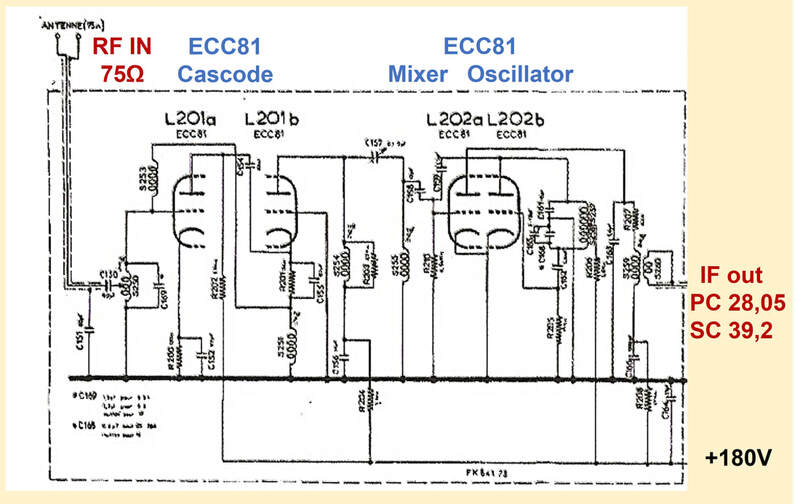 Because combining a dual band tuner with a self-oscillating mixer-oscillator made it all too complex, the first modification was the introduction of the ECC81 as mixer-oscillator; one triode acting as oscillator, the other as mixer. The EF80 pre-amplifier remained essentially unchanged. Because it is impossible to match antenna impedance to the EF80 input impedance over the combined VHF-I and III range, also the input stage now became not only band-specific but also tuned. 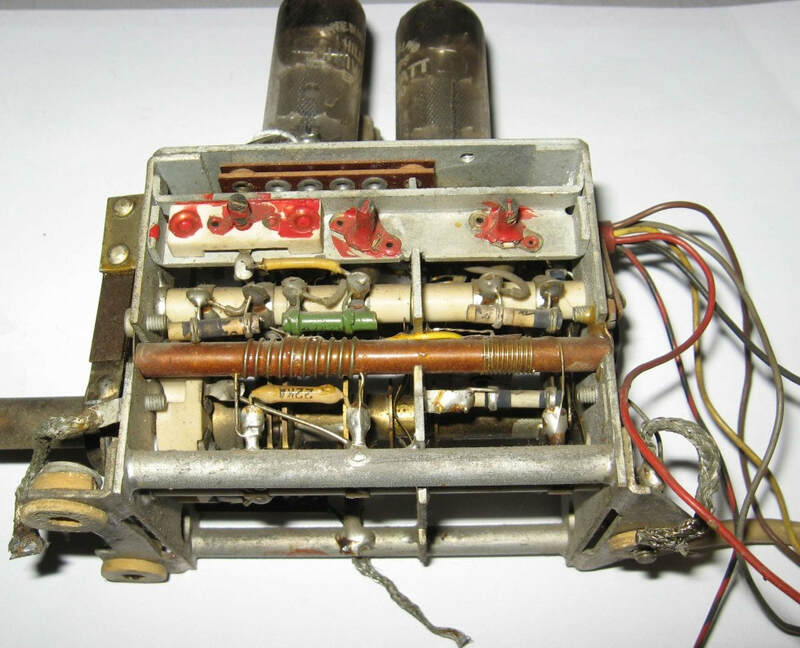 As a result the tuner was the first to have three jointly tuning circuits (input match, BP channel filter and oscillator tank circuit), and all three of them duplicated for VHF-I and VHF-III. A switch linked to the capacitor stepping mechanism would would flip between channel4 (VHF-I) and 5 (VHF-III). 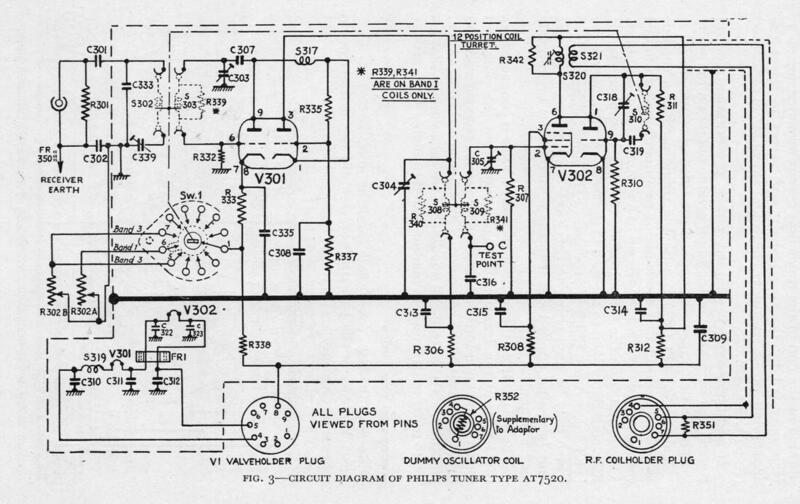 The schematic on the right, from the TX1410U television, is clearer in showing the concept of the tuner (although this one is less clear on the switching, for that the TD1420 tuner diagram is better). The green and red zones show the different ways of oscillator-to-mixer coupling. For VHF-I (green) it is done inductively, with a small coil S10a coupling into the secondary of the BPF. For VHF-III it is done capacitively using C39. Also note that the IF output uses galvanic decoupling from the tuner through S7, a concept so far only used in the TF651A tuner. The AT7501 was used from 1952 in the TX1410 platform, with the main family members TX1410, TD1410, TX1714, TD2314 and TD1420. Also the earlier TX400, TX500 and TX700 received field upgrades using this tuner, which had factory code A3 694 76 and (with slight modifications) A3 695 27. The IF used in this platform was still 23,5MHz picture carrier and 18,0MHz sound carrier, with two remarks; firstly in volume 3C of the "Electronic Valves" series of Philips from 1953, the AT7501 is used in the reference diagram of a 625-line television receiver with IF's at 23,75 and 18,25MHz, for picture and sound, respectively. It is unclear where this comes from, and as far as I know these values have never been used in a real TV set. I therefore still hesitate whether the AT7501 and A3 694 76 are 100% the same or not. Secondly, two later sets of the TX1410 platform, the TX1410U-48 (an NTSC set for Argentina) and the TX1714A both introduced slightly higher IF values with a picture carrier at 26,1MHz and sound IF at 21,6MHz (the TX1410U-48) and 20,6MHz. As far as I can see these where the only two sets using these values, which was almost certainly an intermediate step towards the new higher IF at 38,9MHz that would come with the next generation. Although it introduced the 10-channel tuner, the AT7501 was still a mediocre solution because of one specific item: the EF80 simply was no RF valve. There were two reasons for this. The first and fundamental issue is that pentodes are simply noisier than triodes. Because part of the electron flow out of the cathode is received by the screen grid g2, at the anode this results into "missing electrons" with a statistical behaviour, which can be translated into an additional effective noise contribution. 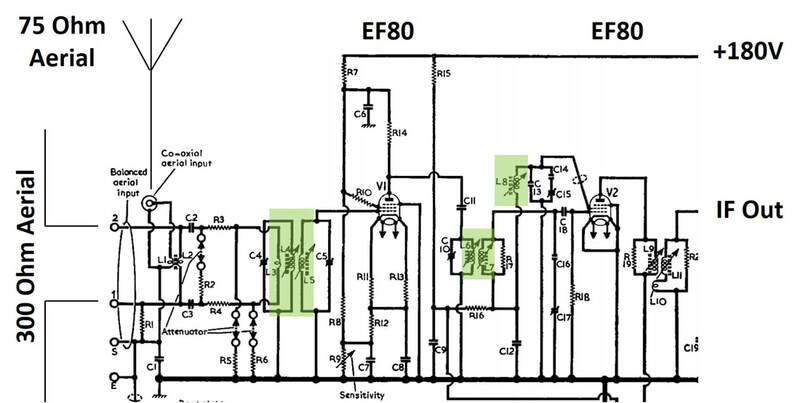 But secondly the EF80 was primarily an IF valve, with parasitic capacitances due to its larger grids that have a negative effect on its high frequency gain and noise performance. Noise Figure was therefore particularly bad, and in practise the EF80 often got replaced by the Telefunken EF800, which had considerably better noise and microphony performance. Telefunken, however, was the biggest European competitor of Philips and it was against all corporate policies to use their valves. These were therefore imported by the Philips Sweden organization for delivery to the local Service organizations. Clearly this needed an internal solution. Overview of the first generation Philips 4- and 10-channel capacitive tuners. Because of the narrower channel width for Argentina (standard M) even 12 channels could be covered. Developments in France and Britain during the first half of the 1950-ies were different from those in the CCIR-B countries Netherlands, Western Germany, Scandinavia, Switzerland, Italy and (with modifications) Belgium. The main reason for this were the unique and local standards: 405 lines in the UK, 819 lines in France, with limited need, desire or possibility to receive TV transmissions with different standards. Furthermore, since both countries were large it took longer to obtain full coverage, and new transmitters were often far apart; e.g. in France the order was Paris, Lille, Strasbourg, Lyon and Marseille. Only in 1956 did the roll out of more regional transmitters start. Britain had a similar roll-out. Because all stations transmitted the same program, owners of a TV set were expected to select the strongest one for reception, and TV sets were thus assumed to need only a one-channel receiver. 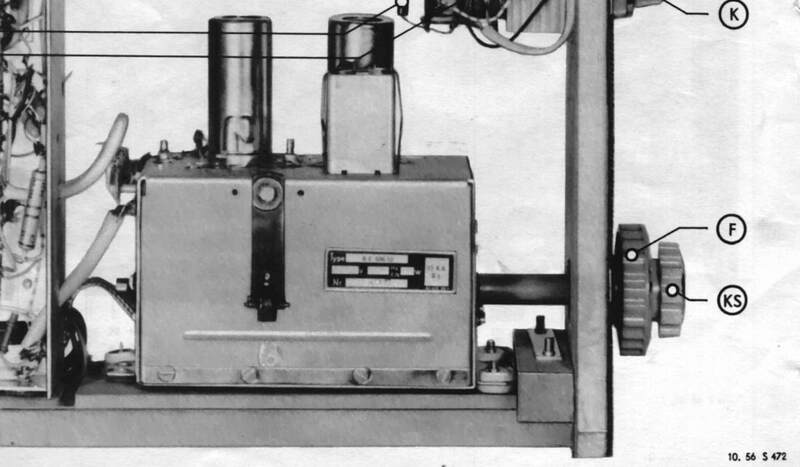 In practise this meant that a basic TV chassis could be equipped with a set of channel-specific coils in the factory, making it a regional receiver. When owners moved home to another region the TV set had to be modified to the new regional frequencies in a service workshop. Until 1950 the RF front ends of the television front ends were all based on dual pentode solutions, two times UF42, EF42 or EF80. We've seen earlier that the performance of these was mediocre at best. The first to introduce a more dedicated valve was France. 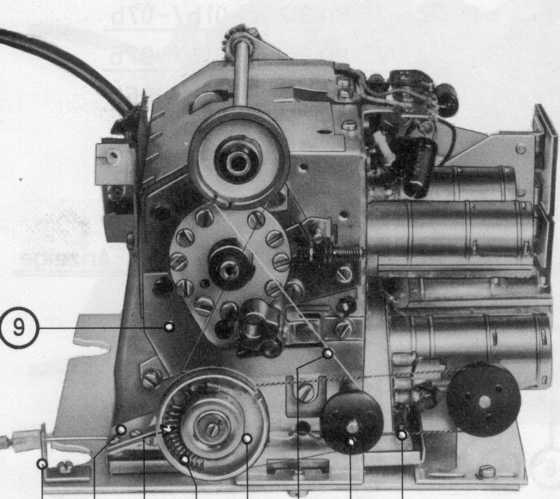 Linked to the roll out of the new 819-line standard from 1951, with its 14MHz channel bandwidth, a much better performance was required, and a new front end based on two ECC81's was introduced. Remember that the AT7501 tuner introduced simultaneously in Eindhoven only used the ECC81 for the mixer-oscillator. Also this French front end was the first to introduce the cascode input circuit. At the same time it was not a tuner, but a fixed single-channel front end, built on the main chassis of the television. This concept was introduced in 1951 with the TF652A, the first Philips 819-line set developed in France, followed by the TF2323 rear projection TV and then the TF1420 and 1720 platform, the local version of the TX1410. But the "single channel front end on the chassis" concept came to an end, and in 1952 the front end function - still not a multi-channel tuner! - became available as a module or bloc monocanal, but still based on an almost identical circuit diagram. These blocs were factory-aligned for a single specific channel, and could easily be exchanged when needed. Initially a single model was required, serving French channel F8a (vision carrier 185,25MHz) of the Paris and Lille transmitters, later the Strasbourg version for channel F6 (174,30MHz) came available. 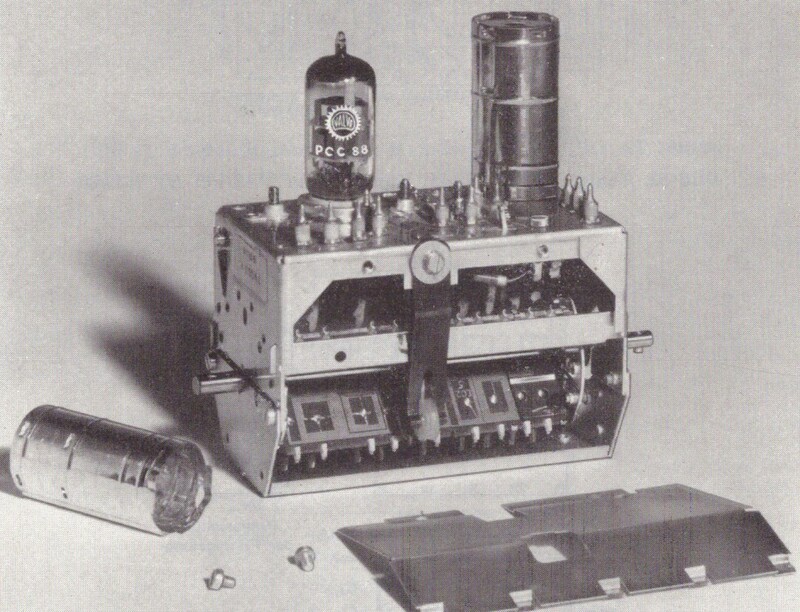 In 1954/55, with the TF1746, the bloc monocanal was replaced by a then standard 12-channel tuner module. Top view of the French Philips TF1435 TV. A single chassis contained all electronics except on the left the RF bloc monocanal (below) and the power supply (above). Close up of the bloc monocanal RF unit with its two ECC81 dual triodes. All pictures from Rétro Forum. Bottom view of the bloc monocanal as mounted on the wooden bottom plate. This clearly shows it was essentially a U-shaped support structure, not an enclosed box, and with no mechanics since it was not tunable. In the UK developments were similar, although not identical. Like in France the front end function remained initially on the main chassis, where the British Mullard-designed chassis tended to have two separate chassis sections: one for small signal (RF up to video output) and one for large signal (synchronization, deflection and HV generation). The design remained based on the two EF80's, so not using the cascode input stage. 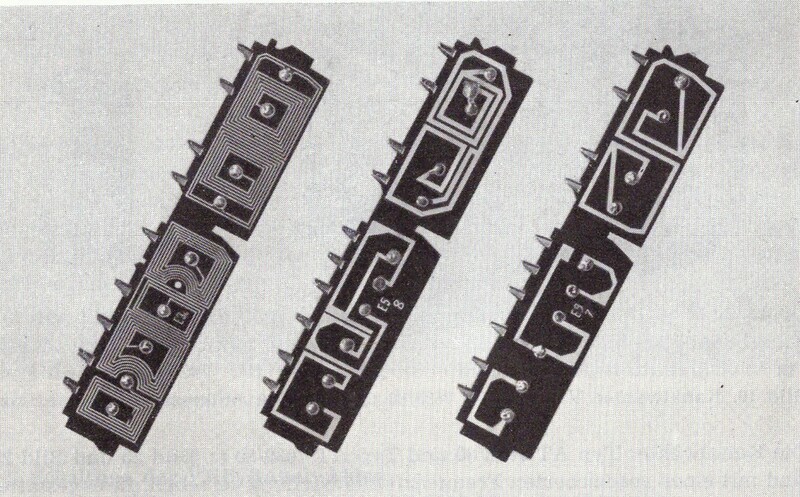 Channel-specific implementations were made using three replaceable coil modules. These modules fitted in standard B9A/Noval valve sockets, were factory-aligned and colour coded, and during set alignment they were not to be touched or changed. Modification of a TV set from one regional channel to another thus meant replacing the three coil modules. This concept was used from 1951 (the 1100 family) until 1953/54 (1400 and 1700 families). By that time a customer could choose between basic modules with the single-channel frontend or optional 12-channel tuners (the AT7520). All in al it is surprising to see that in both the UK and France the Mullard and La Radiotechnique TV design centres were much more conservative in introducing higher IF values and/or multi-channel tuners compared to their colleagues in Eindhoven and Krefeld. The main explanation for the multi-channel tuner is probably that, due to the deviating 405 and 819-line standards, there was not even the possibility to receive transmissions from other countries, this in contrast to Germany, the Netherlands, Belgium and Switzerland which all hand neighbouring countries with (almost) identical standards and programs that people wanted to receive. In France and Britain there was initially only one program transmitted, without the need for multi-channel tuners. Tuners were only introduced once multiple programs were transmitted, especially in the VHF-III band. 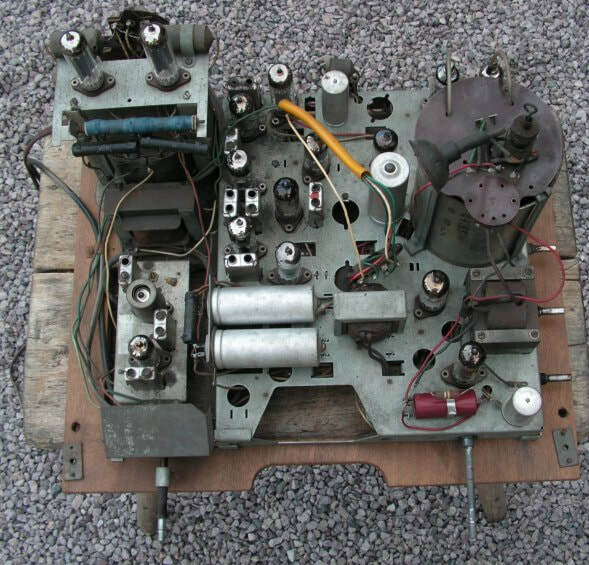 Overview of the British and French front end and tuner solutions between 1947 and 1955, when the Philips TV design centers in both countries finally introduced the standard 12-channel rotary drum tuner. The choice of IF frequencies used in a TV receiver was initially left to the set maker, where every brand applied its own design considerations. These were especially determined by the capability to design circuits with the required performance, and first IF's were thus invariably between 6 and 13MHz. As long as only one single TV channel was transmitted selectivity was not a major issue, but when more VHF-I channels were introduced performance was no longer good enough. Many set makers now used different IF values for different channels, others moved to high VIF frequencies in the 16-23MHz range. With the increase of the number of channels, so did the problem of interference grew. All this has to do fundamentally with the non-linear mixer performance. For the down conversion action (shifting the signal Radio Frequency to a (much) lower Intermediate Frequency, see Tuner Basics 1) a non-linear function is required: a multiplication in the time domain (equivalent through Fouriers theorem to a translation in the frequency domain). This non-linear function is obtained through the characteristic of an active element: a diode, triode or pentode (and later of course the transistor). The problem is that the non-linear characteristic is not a perfect multiplication (Vin + Vlo)^2, that would give the output frequencies flo-fin and flo+fin, but a more general characteristic (Vin+Vlo)^n, where n can be a mostly non-integer number between typically 1,5 and 3. This means that the output of the mixer becomes a - theoretically infinite - range of combinations of harmonics of the input and local oscillator frequencies. At the same time the mixer is driven to higher non-linearity by the LO voltage, because the IF output signal strength is proportional to Vrf*Vlo. Since Vrf is low (the weak received signal) Vlo must be as large as possible. But this in turn drives the mixer to large voltage swings and thus high non-linearity. Fortunately many of the harmonics generated in theory quickly become irrelevant in practice, the amplitude coefficient of the harmonics are proportional to the multiplied amplitudes of their contributing signals, and thus diminish rapidly. This is further strengthened by the selectivity of the circuits and filters around the mixer. For analysis of the interference only the harmonics generated by the strongest signals are of relevance, which are the LO and the IF picture carrier. All harmonics proportional to Frf can thus be neglected. The first issue occurs with harmonics of the IF into the VHF-I band (I will use the CCIR-B standard as reference, so E1-E4 runs from 40 to 68MHz). These IF harmonics, generated in the mixer, might fold back into the RF input signal path and thus give visible or audible interference since their amplitude might be of the same order as the wanted signal. As can be seen from Fig.5, when taking the 2nd, 3rd and 4th IF harmonics into account for the 625-line CCIR-B norm, there are only two frequency bands allowed for interference-free IF: below 10MHz and between 34 and 40MHz. Because the range below 10MHz is not practical, e.g. due to overlap with the video baseband and because the LO frequency would be very close to the wanted channel frequency, and likely in-band. All systems thus moved upwards, with the CCIR-B standard (in Western Europe, and even there not all countries) settling on 38,9MHz picture carrier and 33,4MHz sound carrier. With this the IF ended up as close as possible to the lowest receive channel. Figure 5. The effect of (picture carrier) IF harmonics on the VHF-I band for CCIR-B channel allocations. They show that intermediate frequencies between 10 and 34MHz are the "forbidden zone" and only the 34-40MHz band allows an "interference-free" system. Consequently the picture carrier IF of Philips 625-line receivers moved upwards from 13 to 23,5 and ultimately 38,9MHz, which became the standardized Western Europe CCIR-B IF. Other standards and countries made similar moves, always determined by the standards characteristics and frequency bands used for transmission. Italy, as an example, although using the CCIR-B 625-line standard, did not use channel E1, and consequently moved the IF upwards to 38,9+7=45,9MHz picture carrier and 40,4MHz sound carrier. The US NTSC standard similarly moved to 45,75MHz, while Eastern Europe CCIR-D ended up at 38,0MHz. The UK CCIR-A ultimately also used the same 34-40MHz band, but with reversed signal allocation; the picture carrier at the lower 34,65MHz and the sound carrier at 38,15MHz. However, until these final IF frequencies were settled around 1955, quite some different earlier settings were used as can be seen in below table. Most interesting are the moves of the first three Philips UK set generations, where the IF moved upwards 100kHz with every generation (from 13,2 to 13,4MHz VIF). The reason for this can only be guessed. Then, even more surprisingly, the IF reduced, to 12,0MHz, at which value it would stay for four years! Only in 1955 the jump to 38,15MHz VIF and lower SIF was made, and data shows that Philips/Mullard was one of the last of the many British TV set makers to move to the high IF frequencies. It is not clear what caused this conservatism within the Mullard TV lab, since all other countries were at much higher IV values since 1950. France with its 13MHz wide 819-line standard was the most complex one and will be treated separately. The resulting values are summarized below. Table 1. The step-wise migration of the IF frequencies used in the different generations Philips television receivers from 1946 to 1954, when the final IF standards were settled. VIF= Vision IF carrier SIF= Sound IF carrier. * the 1946 French GenO refers to the old 441-line standard, all other values to the 819-line CCIR-E standard. All values listed are from actual Philips televisions except standard D since Philips made no specific sets for that standard. The analysis of optimal IF is more complex than shown here, where only IF harmonics have been taken into account. Next interferers to consider are harmonics of the LO (especially 2*LO) and the first mixing results of that harmonic with the IF (2*LO+/-IF). The latter especially requires analysis with respect to interference in the next following band. So from VHF-I into VHF-III and from VHF-III into UHF, again depending upon the specific channel allocation in the different bands. It goes to far to repeat that analysis here, but the resulting specific IF values with their fractional values (34,65MHz (A), 38,9MHz (B), 28,05MHz (E) etcetera) are the result of this. Electrically the main innovation in the next tuner family was the introduction of the cascode input stage, based on the new PCC84 dual triode. In contrast to the EF80 so far used in tuners, the PCC84 was developed specifically for the tuner cascode pre-amplifier role. It featured two completely separate triodes (no common cathode for example) with a screen in between. The screen was connected to the grid of the second diode, which would be RF grounded. Parasitics were kept as low as possible to allow operation across the VHF-III band between 174 and 216MHz; the input capacitance of diode 1 (Cgk) was only 2,3pF and the very critical feedback capacitance from anode to grid (Cag) only 1,1pF. The diodes could both operate at relative low anode voltages of 80-90V and still provide a good transconductance of 6mA/V. This in turn allowed that from a DC perspective two triodes could be stacked and fed by a 165-180V supply voltage, each of the two then operating at half that anode-to-cathode voltage. Figure 6. Principal circuit diagram of a cascode RF input amplififer. The relevant valve parasitic capacitances are also shown. One of the first main difference of the cascode to a standard triode or pentode input amplifier is the gain. The gain of a triode amplifier is gm*Rl, whit gm the valve's transconductance in mA/V and Rl the load resistance. But because the first triode looks into the cathode of the 2nd (identical) triode, the load resistance if the first triode is the input resistance of the grounded-grid triode. Which is 1/gm ! This means that the voltage gain of the first triode is gm*1/gm=1. The main advantage of this is that the Miller-capacity, the virtual feedback capacity Cag(Miller) = (1+A)*Cag(intrinsic), is minimal and remains almost equal to the intrinsic Cag. This in turn guarantees a wideband input, covering the entire VHF-I and III bands. The input signal of the 2nd triode Uk will be amplified - in-phase! - with gm*Rl, where Rl this time is the resonance resistance of the output bandpass filter S5-C4. The second triode thus provides the amplification. Noise of the 2nd triode appearing at its cathode will be voltage divided with the internal resistance of the first triode looking into the anode. This gives typically a 7 times reduction, which means that the equivalent noise contribution of the 2nd triode at the input of the first triode is only 15% of the total. 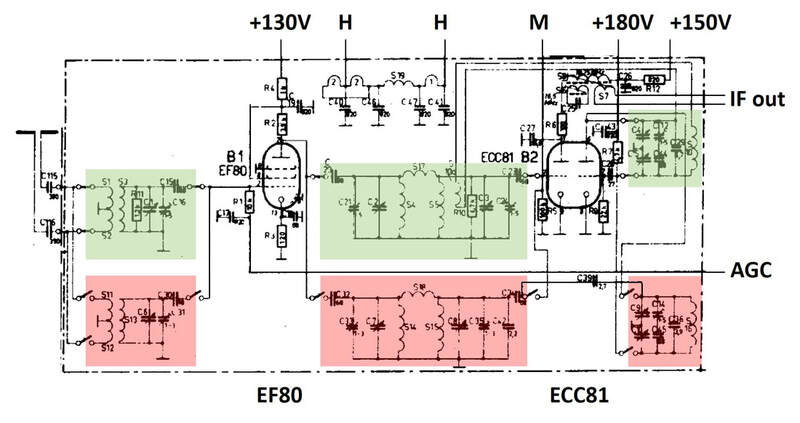 The total Noise Figure of the PCC84 input stage came to 5-5,5dB, giving roughly halve the noise of the EF80 with its 8dB NF. Finally, between the 1st and 2nd triode a resonant bandpass circuit is made using the inductor S10, which, in combination with the first triode output parasitic Cak and the 2nd triode input parasitic Cgk, resonates at the VHF-III band centre frequency around 195MHz. At VHF-I frequencies the inductance of S10 is reduced by a factor 4 and the circuit reduces to a low pass filter. Figure 7. The cascode input amplifier of the Philips AT7530 family of VHF tuners. DC voltages and currents at the different nodes are indicated, illustrating the effect of the serial connection of the two triodes. 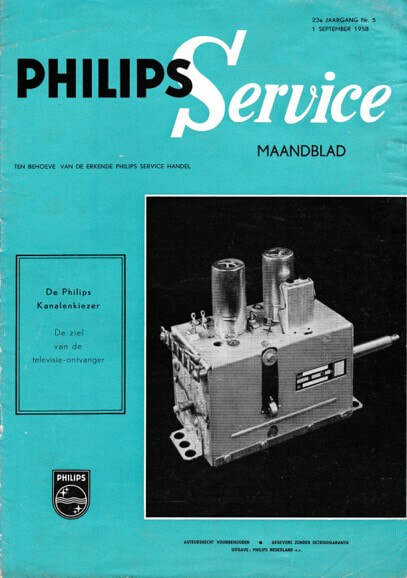 The PCC84 was designed in the Philips Radiobuizen Lab (Radio Valve Laboratory) in Eindhoven. (For a detailed explanation on its organization, role and results see my story on TV development.). It was announced in a publication of the Philips Electronic Application Bulletin of August 1953 (Vol.14, No.8/9, pp.114-120). 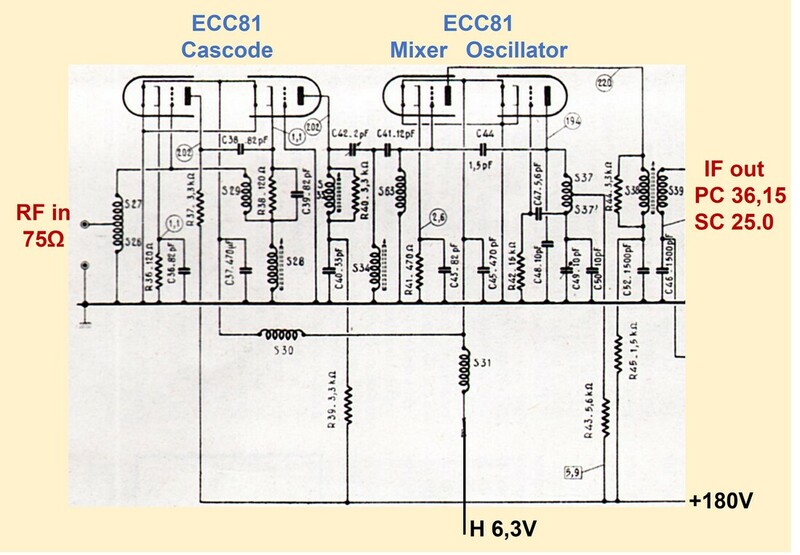 In this paper the mixer-oscillator was still an ECC81. 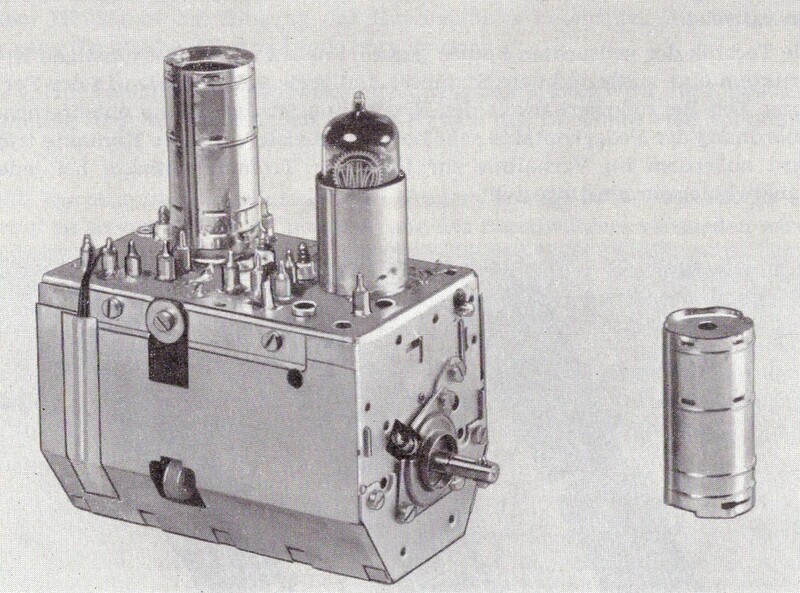 A few months later Mullard, in its advertisement series "Valves, Tubes and Circuits" No.15, introduced the PCC84 together with the new PCF80 MO (to be discussed next). 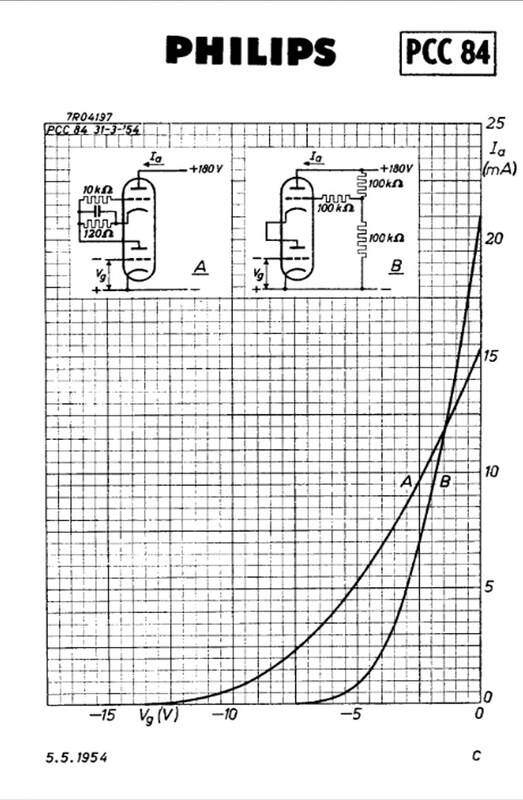 Interestingly, in the EAB article the 2nd valve cathode and in the Mullard publication both cathodes have an 120Ohm series resistance, resulting in lower gain but even higher input impedance of the 1st valve, and also a larger bandwidth. In practical tuner designs as shown left these 120Ohm resistors were always omitted. The reason for that is explained below related to AGC. Although the first generations of Philips TV sets (the TX380, TX390, TX400 and TX1410) did not feature Automatic Gain Control (AGC), it was introduced in the TX1720 from 1952 (commercially launched in 1953). AGC is a control loop, intended to provide a constant video output signal under all signal conditions. First order this means a constant output signal independent from the level of the input signal at the antenna. (AGC becomes more complex in case of strong unwanted channels, but we'll leave that out for the moment). Especially with the number of received channels increasing, the difference in signal strength between those channels could be considerable, with usually one very strong (from the closest transmitter) and others (very) weak, depending upon the distance of their respective transmitters. It was therefore no longer possible - like in the earlier sets that were designed to receive only one or very few channels - to set the gain of the RF-IF-video chain to a fixed value. Most sets used a so-called delayed AGC, which worked as follows (I'll use the TX1720/TD1720 as a reference). The output of the video detector, so the negative modulation video signal, was fed to the cathode of a dedicated EF80 valve in a grounded grid configuration. The anode of this valve was pulsed by the blanking pulses coming from the line deflection unit, thus only gating the valve during these blanking pulses, which meant that the anode current became proportional to the black sync pulse level of the video signal. The anode voltage was divided down to a voltage between 0 and 5V, which was used to drive the grid voltage of the first three EF80 IF amplifiers. Because the cathode voltages were 5V, a grid voltage of 5V (and thus Vgk=0) would give maximum gain and amplification, Vg=0V and Vgk=-5V would cut the valve off. A second delayed control voltage was created through a resistive divider, and started to reduce when the first control voltage was already 2,5-3V lower. This control voltage was fed to the gate of the input triode. So overall when the received signal increased beyond a certain threshold, first the three IF amplifiers started to reduce their gain, while maintaining maximum tuner gain and thus lowest noise figure. Only when the input signal strength continued to increase the delayed tuner control voltage would kick in, now also reducing the pre-amplifier gain to avoid the RF mixer from overloading. At 5V control voltage all valves would effectively be cut off. Although actual voltages might differ depending upon the valves used, this principle of delayed AGC would be implemented in all TV sets from now on. It is now also clear why the 120Ohm cathode resistances were omitted from the real tuner design: as shown in Figure 8, the curve of configuration B without cathode resistors and using external grid biasing is much steeper, providing more amplification and thus lower noise. The behaviour of curve B is usually referred to as "sharp cut-off" as opposed to the "remote cut-off" of configuration A. 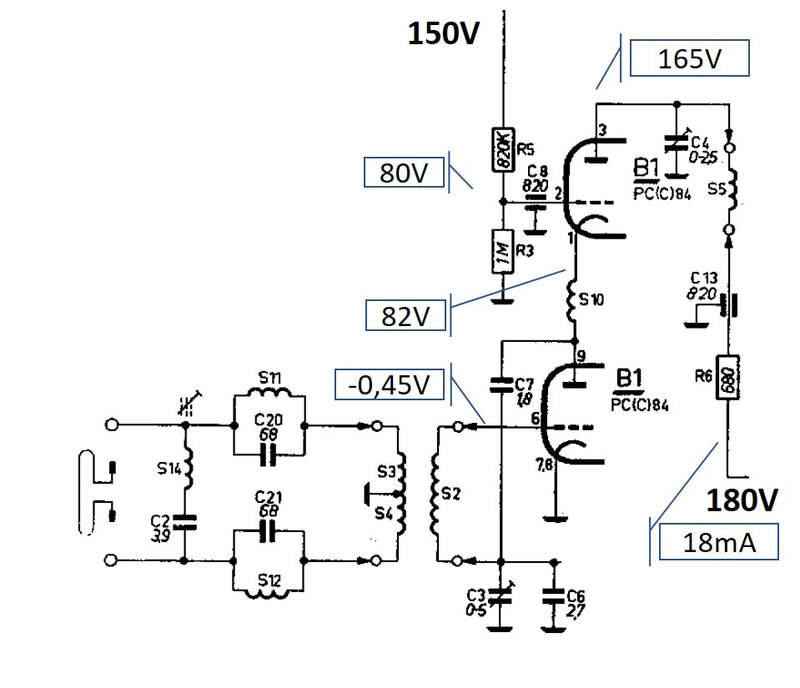 The lower cut-off voltage (roughly -5V vs. -12V) provides easier AGC design and provides almost identical cut-off voltages for the PCC84 cascode and the EF80 IF amplifiers. Although all continental Philips TVs used the sharp cut-off and delayed AGC as described, it is said that Mullard preferred remote cut-off for its CCIR-A receivers. Examples of the filter modules as used in the drum tuner. Left the 5-contact input filter, right the 7-contact BPF and LO tank filters. In both modules the coils are co-axial for (maximum) mutual coupling. The first, immediately visible innovation of the new generation tuners is the mechanics. The only similarity with the previous AT7501 is the square box, bot otherwise everything is new. A rotatable drum containing twelve pre-defined channel-specific filters determines the received channel, where the inductors of the input matching, the channel filter and the LO tank circuit are changed. The tuner is divided into two chambers for maximum isolation between the sensitive RF input and the mixer-oscillator-IF section with its much larger signals. Also on the drum there are two separate sub-modules. The back of each inductor sub-module contains metal contacts (5 for the RF section, 7 for the LO-IF section) that contact a row of spring-based metal contacts (Nr.3 in the drawing on the left). With screws (4) the spring and contact force could be properly adjusted. With this concept, which essentially turned the tuner module into a kind of Lego building block construction, many different tuners became possible. Depending upon the country of destination and its associated standard and IF settings, the required filter modules would be selected. Service workshops could later even add or exchange modules when new channels were introduced, since every inductor module had its individual factory code and could be ordered separately. 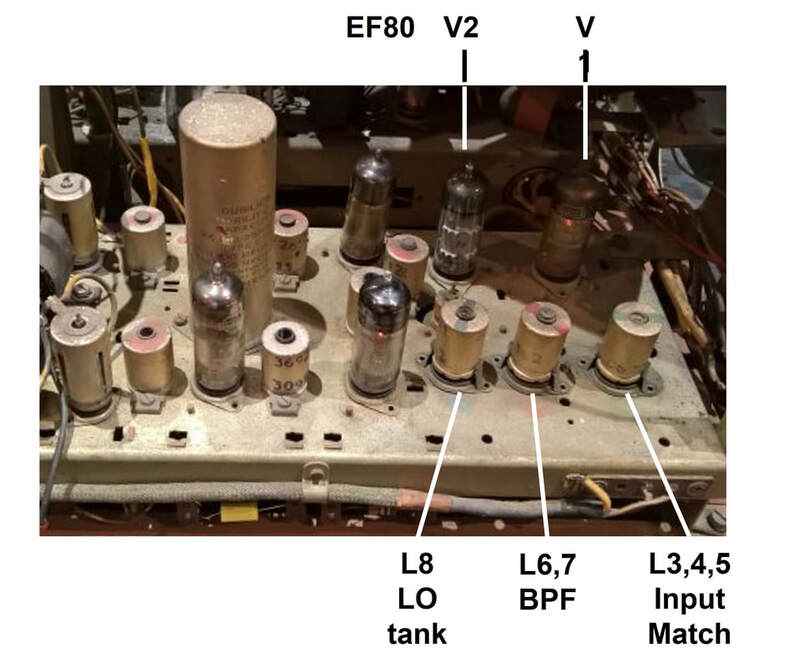 As a consequence more versions of the tuner were produced, covering at least standards B, B-for-Italy, C. E, F and M.
The second new valve introduced in the AT7530 family was the PCF80, a triode-pentode combo valve specifically designed for the VHF mixer-oscillator role. First order the circuit principles didn't change too much from the previous ECC81 based generation, with the triode acting as a Colpitts oscillator with a tuned feedback from anode to grid. The oscillator voltage was minimally 5V at the grid, and would be inductively coupled to the input of the mixer pentode. This inductive coupling was achieved by putting the oscillator coil S7 and the BPF coils S5 and S6 on the same rod inside the drum tuner filter modules, see Fig.5 above. By adjusting the distance between these coils for each channel filter module, the coupling constant could be kept more or less constant across all channels, providing as much as possible a frequency-independent mixer performance. For the mixer the pentode replaced the previous triode, providing more feedback isolation between anode and grid. All in all the new tuner must have given a considerable performance improvement compared to the previous generation. From the schematic it can be seen that the AGC voltage is connected directly to the cold side of the RF input, and through S2 DC-connected to the grid of the first triode. 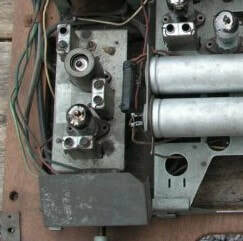 The secondary side of the interstage BPF was in turn connected to an external measurement pin on the exterior of the tuner metal can, which was used during factory alignment of the tuner. 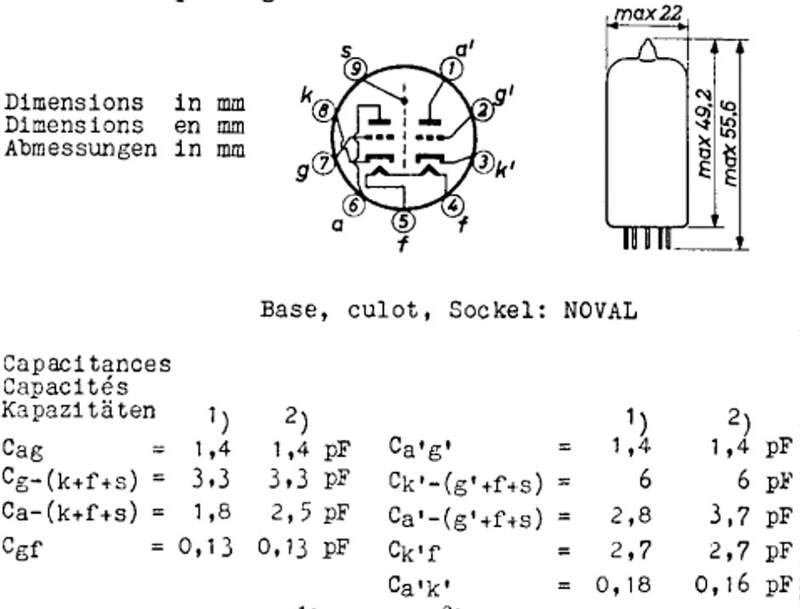 Finally, C18 was a variable capacitor parallel to the oscillator tank circuit, used for fine tuning of a channel. It was operated by pushing inwards and rotating the channel selector knob outer ring, that rotated the shaft of this capacitor. The IF output was tapped from the anode circuit of the PCF80 pentode through coupling transformer, thus making it galvanically isolated from the other tuner circuitry. 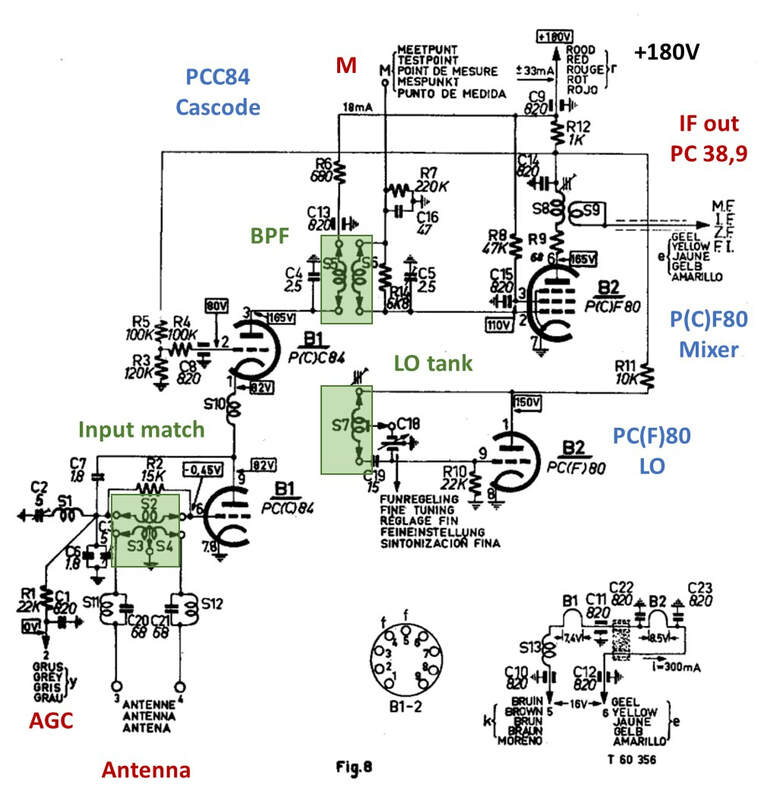 The targeted pass band characteristics of the AT7530 tuner. The known members of the Philips AT7530 tuner family, showing the different models with respect to covered channels and the IF standards. The models starting with A3 696 52 introduced a slightly modified electrical design, mainly related to biasing. A3 models are from Eindhoven, MK from Mitcham (UK), PK from Monza (It) and FD from Dreux (F). 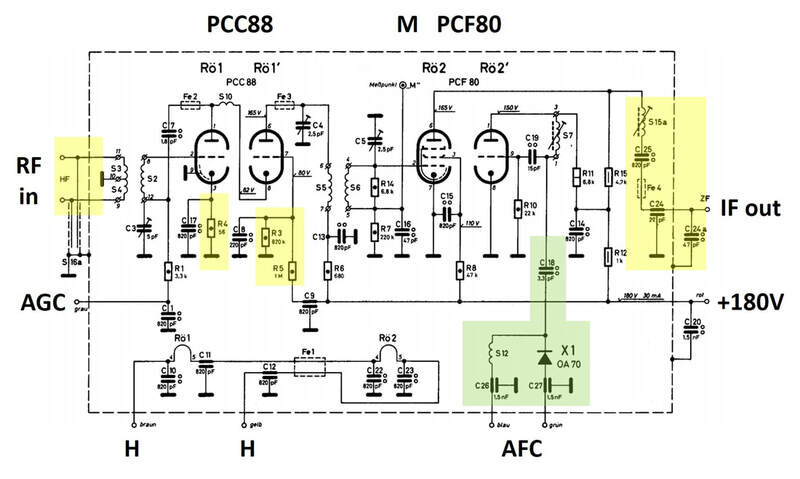 Non-standard valves are highlighted in yellow: 6U8=PCF80, 6CW7=ECC84, 6BL8=ECF80. This tuner family also introduced the first multi-norm tuners, for use in the 17TX100 and 17TX110 series for especially Belgium and French border zones. These tuners like the AT7550 used the same picture IF of 38,9MHz as the regular CCIR-B versions, but required an extended channel bandwidth to accommodate the 13MHz channel bandwidth of the French 819-line standard. The sound carrier thus appeared at either 33,4 or 27,75MHz. With the drum tuner concept, using the optimized channel filter sub-modules, these type of customizations became a lot easier. The same method was applied for the NTSC and Italian standards, both using IF picture carriers around 46MHz, and Australian tuners with a picture carrier lower at 36MHz. Interestingly, in Australia, where the AT7580 was sold to the non-Philips TV manufacturer Kriesler, the tuner was modified to 6,3V parallel heater supply, using the 6CW7=ECC84 and 6BL8=ECF80 equivalents of the PCC84 and PCF80. In 1954 the A3 696 52 introduced slight modifications in the biasing of especially the PCC84 triodes that would be carried over into the next generation (circuit A'). Within the AT7530 family the AT7520 UK version was the only one using a slightly different concept. As it seems this was driven by the specifics of the narrow band 405-line UK standard CCIR-A, with its positive picture modulation requiring different AGC control. At the same time these tuners were still 12MHz VIF - 8,5MHz SIF, since only The sets designers at the Mullard Lab apparently favoured a smoother and longer AGC control, using remote cut-off behaviour as per configuration A in Figure 8. The biasing of the upper cascode triode was thus different from the continental versions, connecting the grid to the cathode using an 18kOhm resistor. the (up to then) standard single-channel arrangement using the region-specific coil set. Even in 1953/54, with the launch of the 1746 and TG1748 sets this remained standard, specified by the /45 type number suffix. at an extra cost of 6-60 GBP the set would be equipped with an AT7520 12-channel tuner. existing sets could be retrofitted with a set-specific 12-channel AT7521 tuner, where the tuner type suffix specified the TV set. This was in fact an AT5720 tuner including further modification material, where differences were mainly related to the mounting of the tuner unit inside the set. sets could use an external AT7522 tuner box. For options 3 and 4 the tuners were equipped with two connectors that were compatible with the Noval sockets of the EF80's and coil filter modules of the original single-channel frontend. The 1st plug used the original EF80 pre-amp socket and connected the tuner to the 180V and heater supplies, the 2nd used the BPF coil socket and connected the IF output of the tuner to the chassis IF signal chain. A third plug contained a damping resistor for the now unused oscillator tank circuit coil. In the TV set the second MO EF80, which was left inside, now became an extra IF amplifier. There is one more oddity, which I have conveniently put into this family, although strictly spoken it is not: the A9 022 78. To start this is the only known tuner using the valve combination PCC84-PCC85. It is completely unclear why this design was used, other than a modest cost reduction compared to the PCF80. Other than that the circuit diagram was identical to the AT7530. This tuner was used by third party set makers that used Philips reference designs, or by sub brands like Aristona. This particular tuner was used in 4-norm Belgian sets by CBRT (Brugge), ACEC (Charleroi) and Sierra. A9 was a Philips Service code, also indicating a different relation with the set maker than the internal fabs. The UK, being an island, could comfortably select a deviating TV standard, since there were simply no adjacent countries within reach with transmissions using different standards (we conveniently ignore the few thousand people along the Channel and on Guernsey and Jersey that could receive French channels). For France the situation was quite different, being surrounded by countries transmitting mostly CCIR-B signals (Germany, Switzerland, Italy and Spain). Neighbouring Belgium and Luxembourg had on the one hand made token compromises on their standards, but for all practical purposes these standards were still closer to CCIR-B than to the 819-line CCIR-E. In the broad swath of roughly 100km left and right of the French borders there was thus the need for multi-standard receivers and similarly along the Belgian borders. To complicate matters further, the French 819-line high-definition standard with 13,15MHz channel bandwidth used overlapping channels with inverted frequency arrangement; odd channels had a low picture carrier and higher sound carrier, the even channels high picture carrier and lower sound carrier. Figure 11. The French 819-line standard VHF-III channel allocation. Before diving into the tuner specifics we need a quick look at the French channel arrangement, as shown left. To allow sufficient 13,15MHz wide channels in the VHF TV band the odd and even channels were inverted as shown, where the sound carrier frequencies of one set were located on the channel separation of the other set (see the dotted lines). Another oddity was channel 8A of the Paris and Lille transmitters. This channel was defined before the channel definitions were finalized and was shifted with respect to the standard channel raster. All in all a much more complex arrangement than the CCIR-A or -B standards. The first generation ECC81 and PCC84 blocs monocanals and tuners consistently used the LO above the wanted channel. As a result an odd and even channel appeared inverted in the IF domain, see the example for odd channel F7 and even channel F8 in Figure 12. Note that the LO-frequency for channel F7 is identical to the picture carrier of channel F12, and the LO for channel 8 to the sound carrier of channel F11. This was done to avoid disturbing beats in case of interfering channels. The consequence of this arrangement was that the sets required double-tuned IF chains, so 28,05 and 35,7MHz for the picture and 24,55 and 39,2 for the sound IF. For details on these sets see Piet's Home-built Television pt2. Also note that the total IF bandwidth was 15,15MHz, 2MHz wider than the channel bandwidth. This architecture was used in the TF1420/1720, TF1730 and TF1740 families. Figure 12. Tuner concept for the first generation French 819-line tuners, resulting in dual IF frequency television sets TF1420/1720, TF1730 and TF1740. Note that the LO for channel F8 has the same frequency as the sound carrier of channel F11, and similarly LO-F7 and PC-F12. Figure 13. Tuner concept for the second generation French 819-line tuners, with fixed IF frequencies. This was introduced in 1955 with the TF1750 television set. Note that LO-F8 = SC-F11 and LO-F9 = SC-F6. For the next generation French tuner and TVs a cheaper concept was chosen, starting with the FD 90 001 drum tuner, part of the AT7530 tuner family, and TF1750 set from 1955. 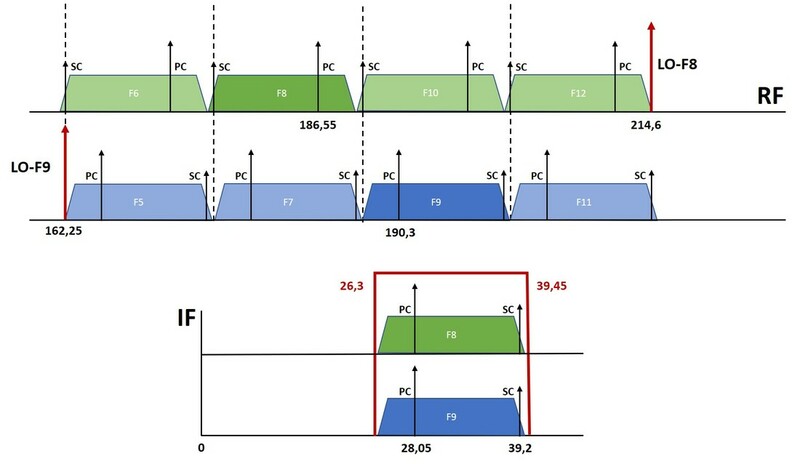 For the odd channels a low LO was used, resulting in identical video and sound IF carrier frequencies for all channels, see the example for channels F8 and F9 in Figure 13. In all cases the LO frequencies are identical to the opposite sound carriers. The only difference with conventional CCIR-B tuners was the low picture carrier IF, an arrangement also used in British tuners. In both cases this was almost certainly chosen to avoid problems with interference from the lowest channel 1 picture carrier (in the French case F2 with picture carrier 41,25MHz). A third way of receiving French channels was used in the Philips 4-norm receivers for Belgium. As explained earlier, these sets were able to receive standard CCIR-B (Dutch or German channels), CCIR-C (Belgium Flanders, with AM sound), CCIR-F (Belgium Wallonie, 819 lines, 7MHz channel, AM sound) next to the standard French CCIR-E. Here Philips decided on a common video IF carrier of 38,9MHz, requiring another up-down inversion of the French channel LO frequencies. In the IF a switchable IF bandwidth was used between 7 and 8,5MHz. This meant that for the French signals some 2MHz of the upper video frequency range was sacrificed, which shouldn't have given any picture quality problems. Figure 14. The tuner concept for French channels in the Philips multi-norm Belgian receivers. All standard used the same 38,9MHz video IF, with sound IF at either 33,4 (B-C-F) or 27,75 (France). In closing we'll have a last look at the IF of multi-norm receivers. Figure 15 shows the video (only!) IF characteristics. At the top the IF frequency characteristic of standard CCIR-B/C/F signals, where the only difference is the modulation format of the sound (AM or FM) or the line rate (625 vs 819 lines). In the video line up typically blocking filters are located at the adjacent N-1 sound carrier (40,4MHz) and N+1 picture carrier (31,9MHz). For the video (!) the sound carrier is of course also filtered out (at 33,4MHz) to avoid sound-to-video picture distortion. The result is the centre graph, showing the video IF passband in a Philips multi-norm receiver. For the French 819-line reception the video IF characteristics were essentially left unchanged except for the 33,4MHz filter that was removed because the sound was much lower at 27,75MHz. This resulted in the lower IF graph, with a -3dB bandwidth of roughly 5,5MHz, still substantially lower than the transmitted 10,5MHz video bandwidth. Sound was treated differently. In the first 21TX100 and 21TX110 receivers the sound IF was separated from the video immediately at the output of the tuner, resulting in a dual frequency IF: either 33,4MHz (B/C/F) or 27.75MHz (E). These were down-converted a second time using an oscillator of 40,4MHz (B/C/F) or 20,75MHz (F), resulting in a 7MHz 2nd IF for further sound demodulation. From the TX170 the CCIR-B FM was using intercarrier sound at 5,5MHz which was used for FM demodulation, the AM sound being processed separately. This scheme was used well into the 1960-ies, when new methods emerged. Throughout the story up to now it is clear that tuner module development and key component (valve) development went hand in hand, because tuner performance was almost one-to-one related to valve characteristics. As we've already seen in the story on early TV development (here, here and here), the group responsible for (amongst others) the specification and development of new TV valves was the Radiobuizen-Lab (Radio Valve Lab) located initially on the 4th floor of the Witte Dame building (EF4) on the Emmasingel in central Eindhoven. The group responsible for Consumer Valves, serving radio and TV applications, was led by Bert Dammers, the boss of my father when working there, and as explained earlier a brilliant designer of innovative valve-circuit combinations. He was personally at the basis of the success of the Philips television, radio valves and even the tuner businesses. As a consequence of the broader television growth, both in sets and components, also the RBL Consumer Group continued to grow, led by Dammers. 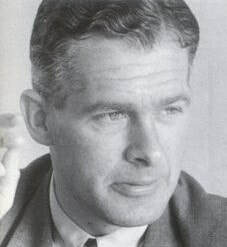 In 1956 he became the head of the entire lab, covering both Consumer and Professional groups, and the lab was subsequently usually referred to as the "Dammers-Lab". In the meantime it moved to the first floor (EF1) in the Witte Dame. During th early 1950s the RBL Consumer Group was undoubtedly occupied with the improvement of the many TV functions, driving for more advanced valves that would either reduce cost (often by integrating functions into combi-valves like triode-pentodes) or increase performance (e.g. the series of improved power pentodes like the EL86 for audio and the PL86 for the line output). Frame grid valve developments will definitely have been part of the activities, leading to the improved RF valves used in the tuners. The RBL essentially continued its activities unchanged from the time it started in 1946, growing with the business of the HIG Elektronenbuizen. 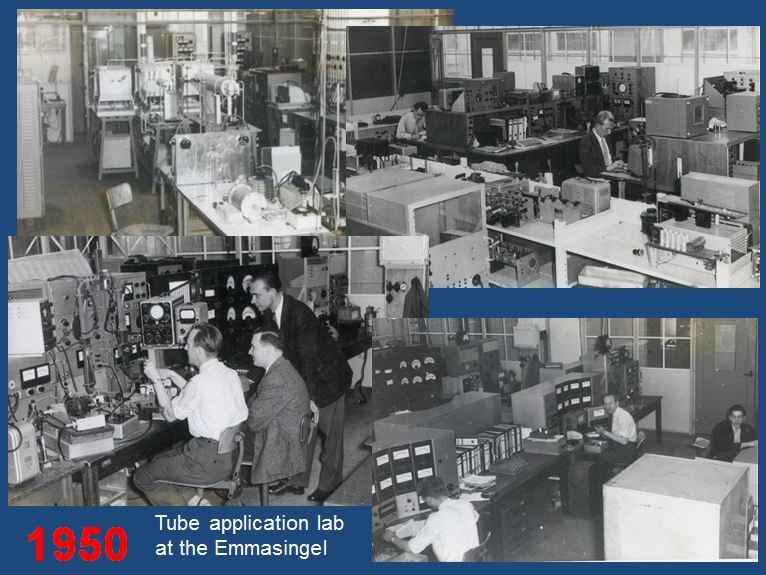 Only in 1965, so after almost twenty years, there was a real change: the HIGs Elektronenbuizen and Industrial Components (ICOMA) were combined into the new HIG Electronic Components and Materials (ELCOMA), and the Radiobuizen-Lab was re-named Centraal Applicatie-Laboratorium Bouwlelementen (Central Application Lab for Components, in short CAB). This was also the trigger for moving the lab out of the Emmasingel to the Beatrix complex on the western outskirts of Eindhoven, which was implemented in 1967. However, Bert Dammers didn't witness this any more, since he fell seriously ill and died January 1968 at the young age of 57. The Lab would nevertheless continue to play an important role in component innovation as we will see in the coming chapters. In 1956 an upgrade of the AT7530 family was introduced, using a next generation RF valve: the PCC88. This valve was another Eindhoven Radiobuizen Lab development within the HIG Elektronenbuizen (Electron Valves Division), undoubtedly driven by requests from the HIG Apparaten (Set Division) for improved tuner performance. 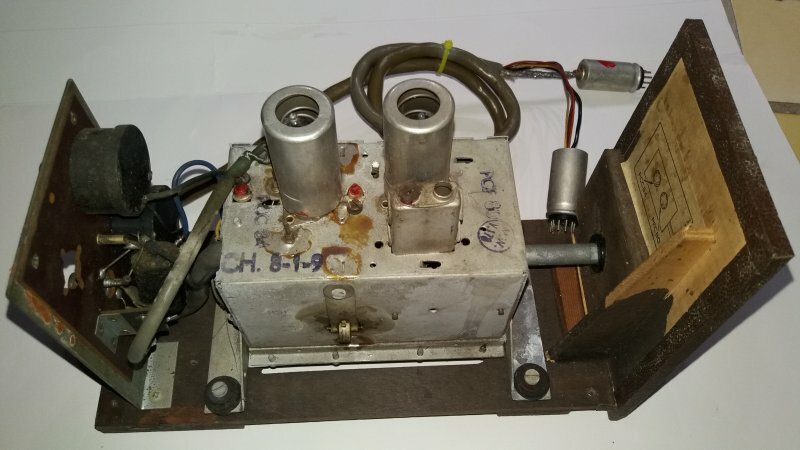 As was mostly the case with new valves, the first version was a 6,3V parallel heater version ECC88, but followed shortly by the 300mA serial heater PCC88 version. (It would also be produced extensively as the E88CC high quality version as well as the 6DJ8 in the US). The PCC88 was introduced in Philips sets in 1956, although it seems the commercial launch to third parties was at least one year later. Apparently Philips wanted to keep the valve away from competition. 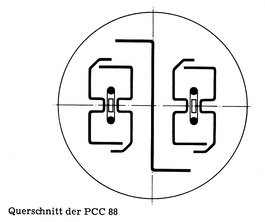 The PCC88 was one of the very first valves to be based on the "frame grid" technology (in Dutch spanrooster and sometimes also called "guided grid"), a breakthrough that delivered almost twice higher transconductance and thus amplification. The basic concept was to bring the first grid as close as possible to the cathode, while simultaneously increasing the number of windings of much thinner wire (from 75 or 50um now 10um). 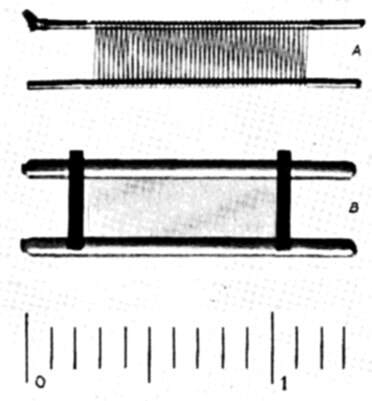 To provide structural strength and stability the grid windings were wound on a pre-fabricated molybdenum support frame. To make the distance between cathode and grid constant, the cathode emitting materials were no longer sputtered onto the cathode metal frame but laid around it like a ribbon. The distance between cathode and grid could thus be reduced to 50um. As a result of this the anode could now also be brought much closer to the grid, at least in the flat area between the support rods of the grid. The net effect of these measures was a roughly doubled transconductance (from typically 7 to 14-15mA/v) at roughly constant parasitic capacitances. b. the higher gain, specifically in the top triode, will provide for a larger RF input at the mixer, thus reducing the noise contribution of the mixer pentode. Overall this must have provided for a sufficiently important (noise figure) improvement to justify the introduction of a dedicated new valve. Which seems to have been successful in this respect, since it would be the standard pre-amplifier valve in Philips tuners for almost eight years, from 1956 to 1963. One further modification compared to the PCC84 was the screen separating the two diodes. In the PCC84 this was connected to the grid of the second triode for (RF) grounding. The 9th pin (next to the 2x three for the triodes plus two for the heater wires) was used to provide a second cathode contact of the bottom triode cathode. In the PCC88 this cathode contact was sacrificed to provide a separate pin for the screen, which could now e.g. be really grounded, as opposed to the 2nd grid that was only RF-grounded through a capacitor. In contrast to e.g. radios and television sets that had a well-defined, albeit regularly modified, naming convention, the tuner was one of the many components and modules that went into a set, and therefore followed different coding schemes. During the 1950-ies up to 1963 there were two categories of codes attached to modules like a tuner: factory code and possibly a product code. All components that went into a Philips set, from the smallest resistor and screw to a complete tuner module, were allocated a factory code. For Eindhoven-designed television sets these codes mostly started with A3 followed by three digits indicating the component category and two digits for individual parts. For tuners the category code started with 694, then 695 and 696. However, towards the end of the decade this system became congested, and we will start seeing jumps to free numbers. At a certain moment modules were also produced in other locations, Krefeld (BRD), Monza (It), Mitcham (UK) and Dreux (F) being examples. In that case components obtained a local factory code according the same principle but with A3 replaced by mostly a 2-digit code. Krefeld was KR, Monza PK, Suresens FK, Dreux FD, Mitcham MK. Barcelona, in contrast, put ZB in front of the A3-code. AT = Television-specific modules; Tuners, Line Output Transformers & Deflection Coils, Remote Controls. (In practice it seems AT was also used as "Afstemeenheden en Transformatoren", or Tuning Devices and Tranformers, but this was not the official source of the code). So the T stands for Television, and not for Tuner! Within the AT category VHF tuners were coded AT75xx, UHF tuners AT63yy. Later also the category NT57xx was used for tuners, but it is unclear where this came from. Finally it should be noted that actual modules received a tracing code referring to the production plant. Especially Eindhoven used internal Philips sub-contracting for its manufacturing, e.g. to the Volt factory in Tilburg. Products in that case received the code V followed by 2 digits for the week code and one digit for the year (1953 = 3 etc.). So V273 for week 27 in 1953. The PCC8 dual triode. Later they were also offered as matched pairs, with identical characteristics. The Philips A3 768 28 tuner. This was a version for Belgium, covering the four norms. The Philips KR 361 54 tuner, the first one introducing Automatic Frequency Control using an OA70 germanium diode. 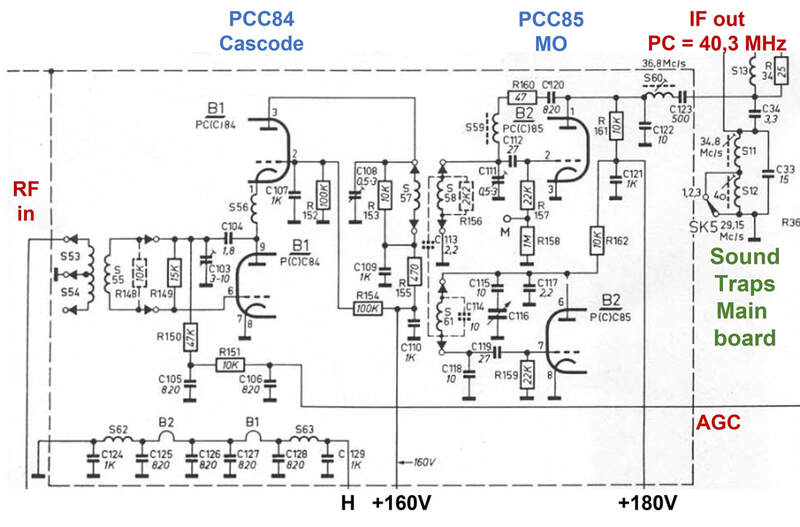 In principle the new PCC88-based tuner had the same circuit diagram as the previous AT7530 generation, including the slight biasing modifications of the upper cascode triode (the two resistors forming the voltage divider for the grid voltage were increased from 10ok and 120kOhm to 820k and 1MOhm, possibly to provide higher isolation of the oscillator signal through the power supply lines). 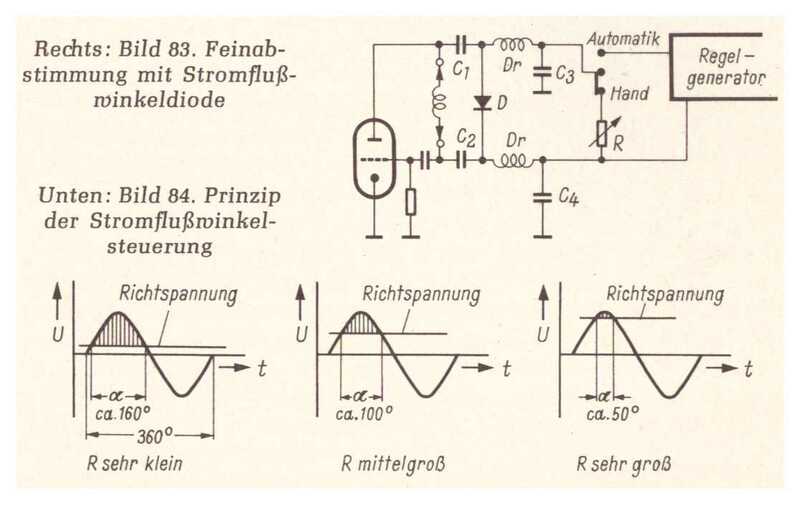 To allow a "deeper" gain control of the input triode, the main change in the design was the introduction of a series cathode resistor of the input triode, R4 of 120 Ohm and RF decoupled by C11 of 820pF. This put the cathode DC voltage to almost 3V at Vgk=0V. Finally as can be seen on the circuit diagram, the now separate screen of the PCC88 was directly grounded to earth, while an RF bead was introduced in the anode feedback capacitor C7 to avoid oscillations. 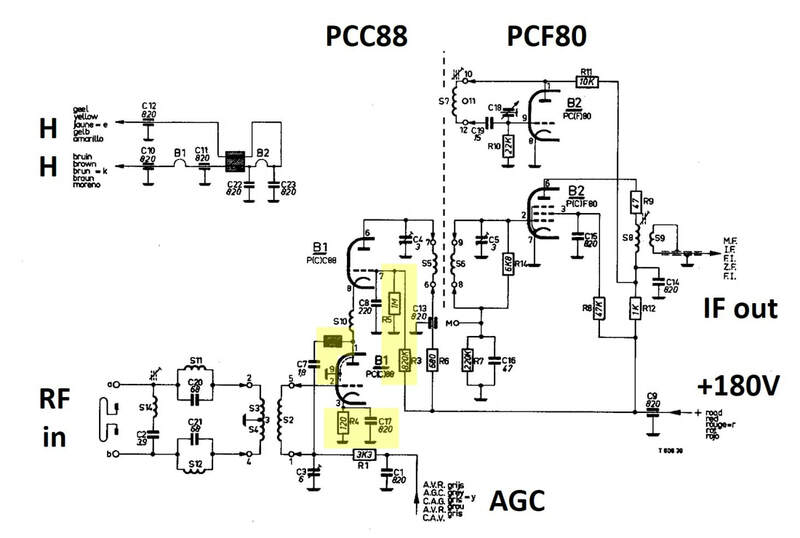 The oscillator and mixer circuits around the PCF80 remained unchanged, including the galvanic output coupling. The first model of this new tuner was the KR 361 52, which was very successful and used in a series of Krefeld Leonardo and Raffael high end television sets (21TD140, 180, 210 and 230). The KR361 53 was identical apart from an additional small capacitor c19a at the oscillator tank circuit, undoubtedly for some form of optimization and yield improvement. Most interestingly, however, was the KR361 54, which introduced Automatic Frequency Control (AFC)! 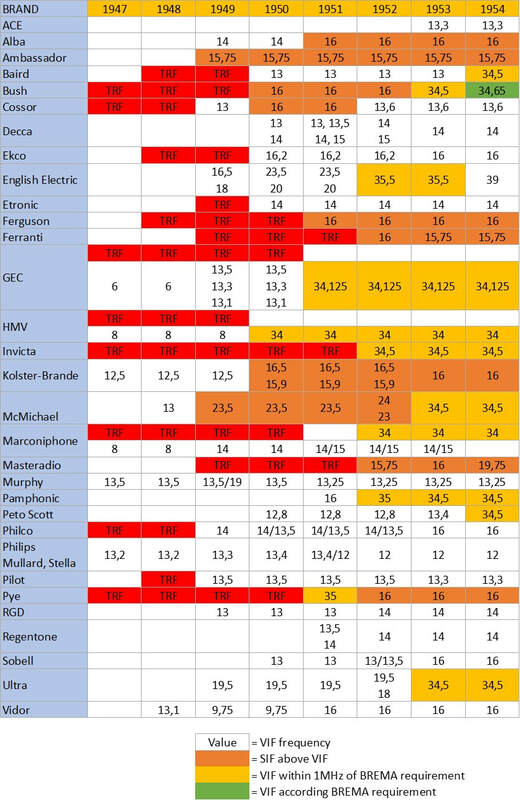 Overview of the known models of the A3 768 15 Philips tuner family, the first to introduce the PCC88 valve. A3 are Netherlands models, KR are from Krefeld (BRD) and PK from Monza (It). The EA9143 was produced by the Z-factory in Barcelona (Spain), a Philips subsidiary. French models from Dreux are clearly missing from the list but should have existed too. TV product codes in the last column in bold indicate Belgian 4-standard sets. Automatic Frequency Control (AFC) is a control mechanism where the frequency of a signal is kept at a constant frequency. In practice this means that the frequency of an oscillator is controlled although the frequency that is being measured and thus controlled is not necessarily the oscillator frequency proper. In TV reception the purpose of the AFC is to control the IF stability, where the control mechanism is to tune the tuner RF oscillator. To this end the AFC will have to measure the deviation of the signal frequency from a desired value, thus requiring a zero-crossing frequency discriminator, where the error signal due to a possible instantaneous dviation from this target frequency would drive the oscillator in the right direction to bring the difference back to zero. AFC was an expensive function, requiring a dedicated PCF80, and was only used on a limited number of high end sets. 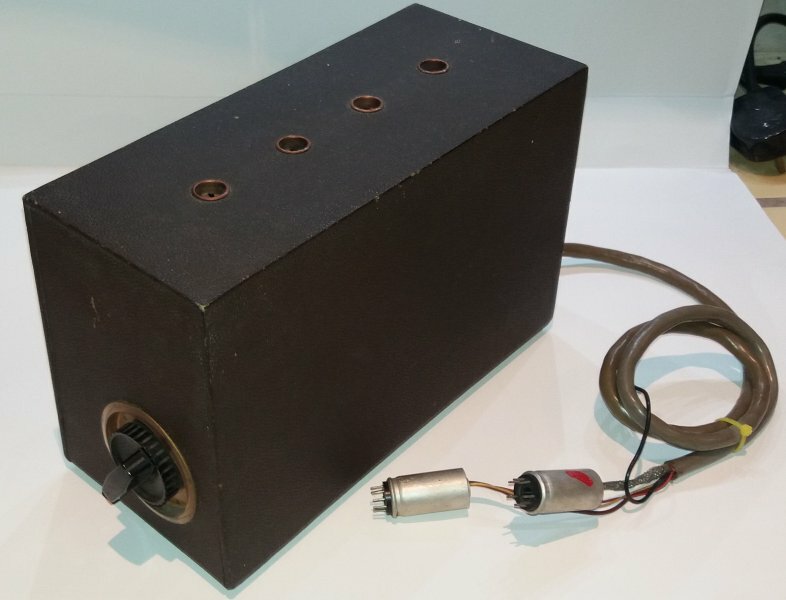 The first use was in the 21TX251A, an Eindhoven design using the next generation A3 792 41 tuner, and the 21TD290A, a Krefeld-designed version using the KR 361 54. Both tuners are from 1958, while the sets were launched in 1959/60. 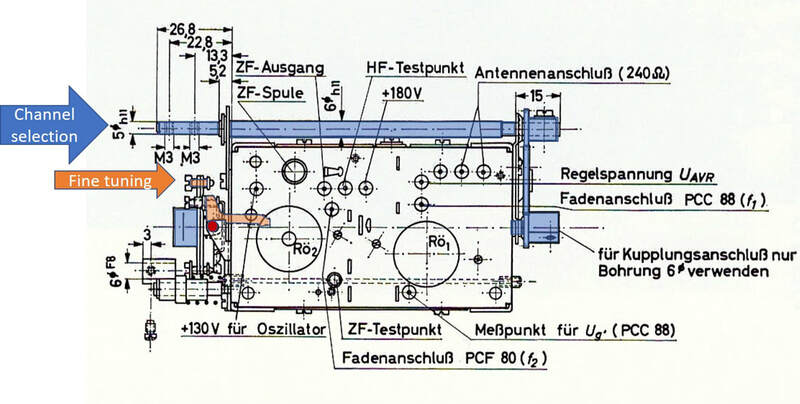 Because the 21TX290 design is simpler (since only for VHF reception) than the 21TD290 (which also featured a UHF tuner with the associated switching) we will use here the first schematic, despite its newer tuner. 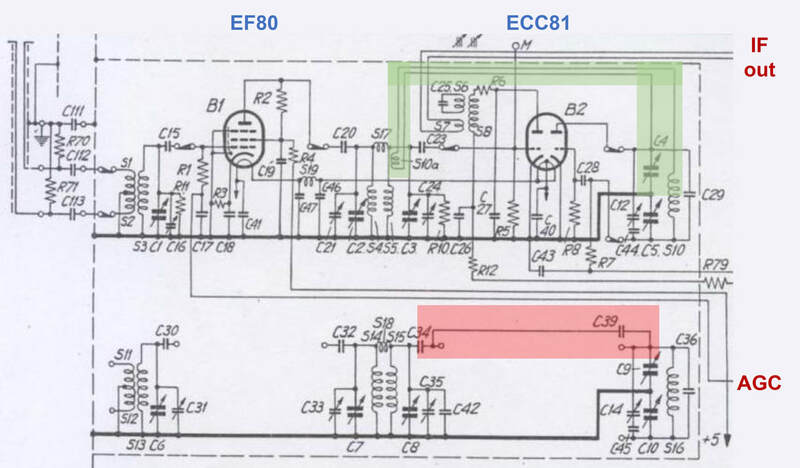 For the AFC the IF signal was tapped off after the last IF amplifier, just before the video detector, and fed (the green line) to the pentode of the PCF80 (B25p in below schematic) for buffering and amplification. A Foster Seeley discriminator using two OA72's then provided a frequency discriminator curve centred at 38,9MHz, the picture carrier. The triode section (B25t) essentially buffered the discriminator output ( a voltage proportional to the deviation of the picture carrier from 38,9MHz) and generates a voltage across the diode inside the tuner (red and purple lines) that induce a current through the AFC diode. The current through that diode will result in a changing parasitic capacitance that will de-tune the oscillator tank circuit in the right direction. Note that the AFC is thus based on the forward effective capacitance change of the diode, which is not the same as the reverse capacitance of a varactor diode, introduced later! 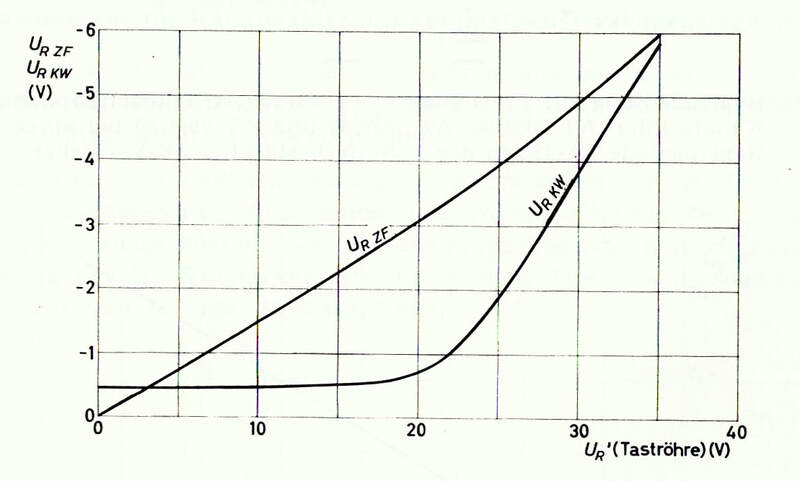 The fine tuning concept is also known as Stromflusswinkelsteuerung (conduction angle control) because what is effectively controlled is the duration of the conductive state of the diode in each RF signal cycle, see the figure. This is equivalent to an angle relative to 360degrees that the diode conducts. This in turn gives a varying effective resistance of the diode, which - in combination with the coupling capacitors - yields a variable equivalent parallel capacitance. However interesting the AFC concept, it was not to become a standard feature in the Philips TV's. Apart from the few 21TX250 and 23TD290 versions, both from 1958 in the Netherlands and Germany, respectively, there are no traces of AFC in subsequent platforms. The reason for this is not clear, but can be related to for example cost, stability of the solution or the lack of visible added value. a new module housing, with the bottom sides slanted inwards, roughly following the contours of the revolving drum inside. This was undoubtedly a materials saving measure, since the two lower areas of the tuner were unused. This basic form factor was to have a long life, even surviving the introduction of transistors and only to be replaced in the early 1970-ies. printed coils on the channel-specific "biscuits" used in the revolving drum. This was again a cost saving, avoiding the costly manual labour of assembling the many different precision air coil assemblies. Challenges with the new concept were most probably the accurate trail-and-error definition of the proper inductive values of the printed coils. For the low frequency coils the challenge was undoubtedly to obtain sufficient inductance with sufficient windings on the limited printed circuit board (PCB) area. Also, compared to the standard PCB technology introduced for the main electronic board in TV's, these tuner prints required substantially finer traces and thus a more accurate printing and etching technology. Memomatic, an innovative mechanical construction to store the fine tuning setting for each of the 12 channels individually. It seems that the printed coils were not introduced from the very first models in this new generation of tuners, so the AT7630-7633 were probably still using discrete coil "biscuits" like the previous generation. But rather quickly versions with printed coils appeared, starting with the AT7634. From the picture below it is clear that for the largest coils, with the highest number of windings, a fairly fine pitch PCB technology was required. the input matching filter became more complex and effectively two stages, one for antenna matching and one for matching to the PCC88 input. the oscillator anode power supply was separated from the general +180V supply pin and obtained a separate 130V pin. This was undoubtedly for better LO isolation through the power supply lines and to avoid unwanted effects like oscillator pulling. 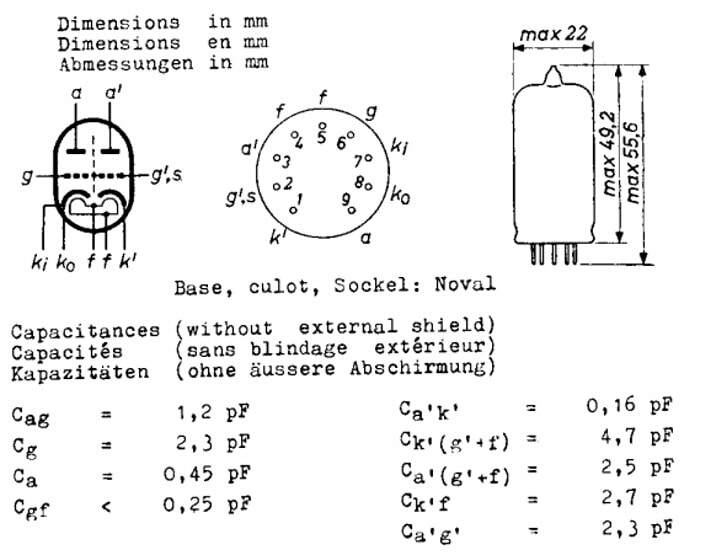 Circuit version D2: the separate trimmer capacitance for the oscillator tank circuit (C19) was deleted, which indicates a higher stability of the design with reduced need for fine tuning with the trimmer. Circuit version D3: this introduced an additional series inductor (S16) in the IF serial output of the PCF80 pentode section. This was most probably to reduce RF and LO radiation at he IF output pin. Simultaneously the 2nd grid of the PCF80 pentode was connected to the new 130V oscillator power supply pin. This change was implemented together with the introduction of the printed coils as well as the Memomatic. 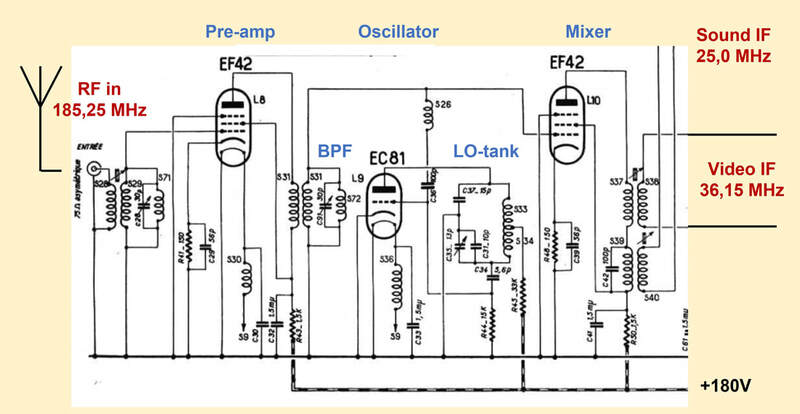 Circuit version D4: to improve the coupling of the oscillator to the mixer input (probably for higher frequencies) a direct 1,5pF capacitive connection was made between the oscillator anode and mixer input of the pentode. Most of these modifications clearly have the characteristic of fine tuning of the performance, equalizing the frequency characteristics, and reducing crosstalk and radiation. The VHF valve-based tuner was clearly becoming mature. Towards the end of the 1950-ies the number of transmitted VHF channels increased rapidly. One consequence of this was the move to UHF, introduced on the next page. A second, quite different effect, was the need to "remember" channel tuning conditions when changing between channels. Don't forget that with the television sets as they were at the time, the channel selector was a large rotary knob mostly on the side of the cabinet, with an outer ring for the fine tuning. Every time the viewer changed channel this had to be done manually, first selecting the channel, then the fine tuning. Over the coming years we will see many efforts to make channel selection easier. Since there was no way to store data electronically all these solutions were invariably mechanical by nature. The first one was the Memomatic or (in German) Memomatik. The core concept of the Memomatic was to use a small bolt per channel (the orange arrow) for fine tuning, i.e. the setting of the oscillator tank circuit trimming capacitor C23. The tip of the bolt pushed a cantilever (orange, turning around the red axis) which pushed the core of the tuning capacitor C23 inside the box. Every channel has its own bolt, which were positioned on a circular plate on the central axis, 12 in total. The bolt was set once per channel, after which it was in the right position every time the channel was selected, acting as a mechanical memory. A consequence of the new Memomatic mechanical construction was that it was deemed impractical to maintain the primary channel rotation know on the same front side of the module. 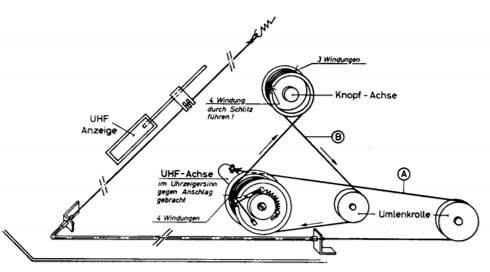 As a consequence this function was "diverted" from the front to back face of the module through a set of beams and gear wheels, indicated in blue on the mechanical drawing. 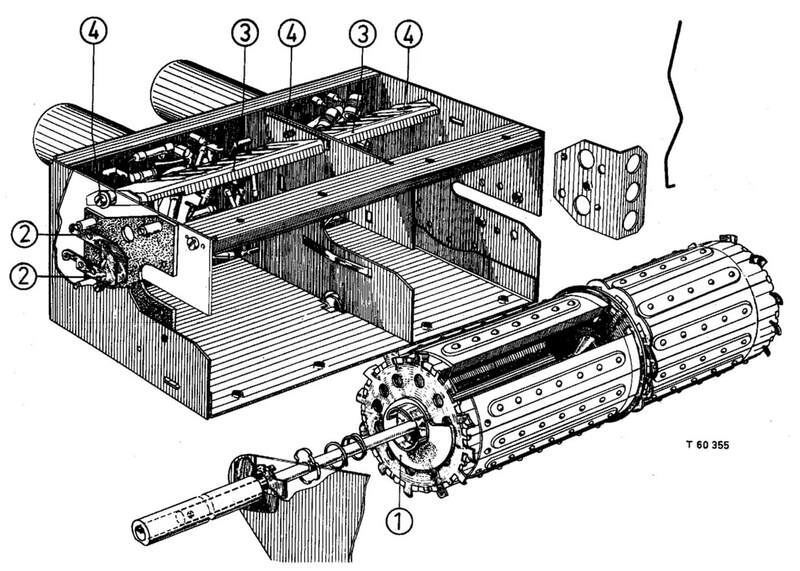 The Memomatic was thus an impressive mechanical piece of engineering, a first of more to follow. Despite the complexity, which hopefully didn't cause any reliability issues, and the associated higher cost, the Memomatic seems to have been a success, since it became a widely used feature in many successive tuner and TV generations. At the same time it could easily be deleted and replaced by a standard tuner, making it an interesting commercial selling feature. 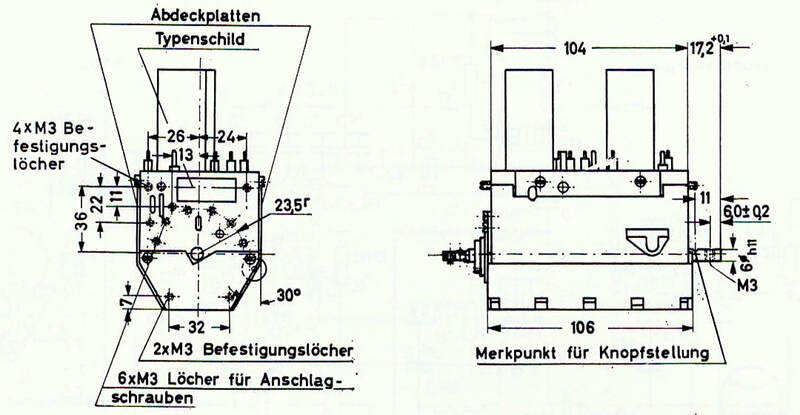 A complete Memomatic tuning unit is shown on the left, a module from 1960 in most probably the 21TX310 or 21TD310. Above is an AT7637 or A3 300 40 VHF tuner, mounted horizontally on top of a first generation UHF tuner. Although the picture doesn't show the complete construction with respect to the control, it is clearly visible that the wheel on top is used for the VHF drum rotation as described earlier. The wheel lowest left is for the UHF tuning. Looking at the construction it is almost certain that the per channel fine tuning using the 12 screws had to be done by a service engineer, given that they don't seem accessible by the television set user. 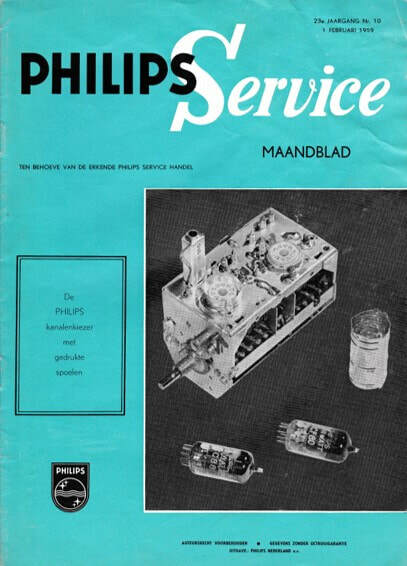 Overview of the expanding Philips AT7630 VHF tuner family, which introduced the new mechanics and later also printed circuit coils (column PCB) and Memomatic tuning memory. TV set names in bold refer to 4-norm sets. The above table with the overview of the (initial) AT7630 family of VHF tuners shows a continuous expansion compared to the previous generations. Especially French and Belgian multi-norm solutions gave an increasing diversity, mainly due to the channels used. Halfway the entire family came the upgraded to the cheaper printed coil filter modules as well as the Memomatic option. And finally there were the locally produced tuners like in Italy and the UK. And before closing this chapter it is interesting to get a glimpse at the prices of these tuners, form a September 1960 price list of Philips components for electronic hobbyists. It shows the AT7632 for Hfl60,00 an the AT7635 for Hfl65,00, confirming they were after the picture tube the most expensive electronic components. For comparison the complete high-voltage line output unit was Hfl30 and the deflection coil unit Hfl25. (The Hfl60 must have been around 60DM, 1200BFR, 180FF and 20GBP at the time). With this last generation of tuners we've reached the end of the 1950-ies, almost 15 years after the start of television broadcast in Europe. 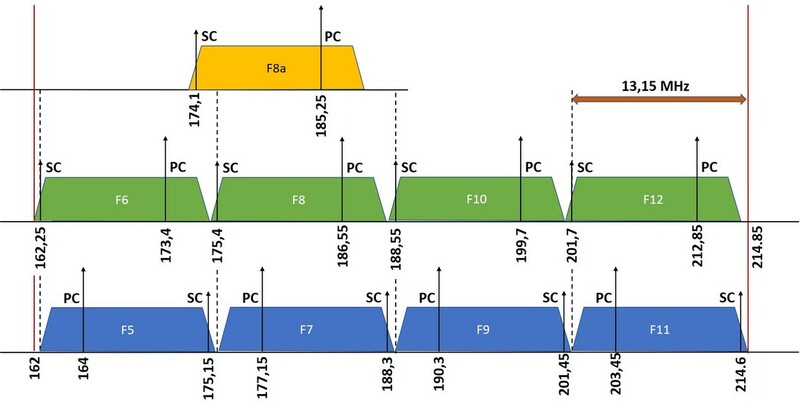 In these 15 years the RF front end function has evolved in five generations from a single channel low performance front end that was part of the main chassis to a dedicated 12-channel tuner with good noise performance, standard tuner AGC, if desired AFC for automatic fine tuning and finally the Memomatic option for storing the channel fine tuning. The only downside of all this was probably the size, since this tuner module was the second largest component in a TV after the picture tube. It was almost certainly also the second most expensive component. The other fact of life, which was not easy to change, was that tuning was a purely mechanical operation, turning a big knob on the side of the set. In the next decade we will see efforts concentrated on size reduction and easier tuning. But first the introduction of a new frequency band! References for pt1 and pt2 are included at the end of pt2.